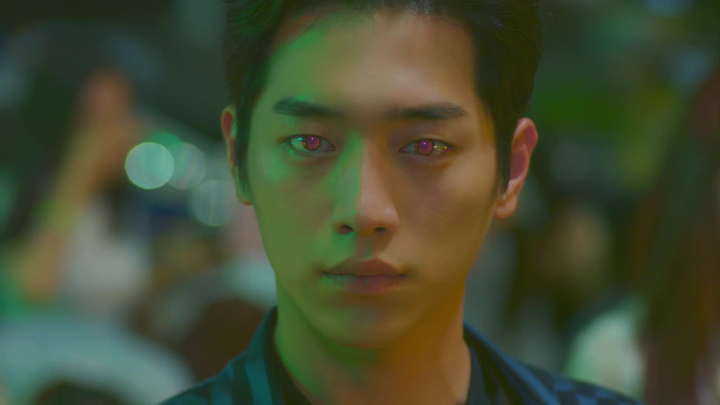 We were brought into watching this 2018 Korean drama, Are You Human Too? by the story that was about an artificial intelligence (AI) robot standing in for the human his appearance and personality was created from. It sounded like an excellent watch! With a setup like this, we thought there would definitely be interesting interactions between characters. With Are You Human Too? 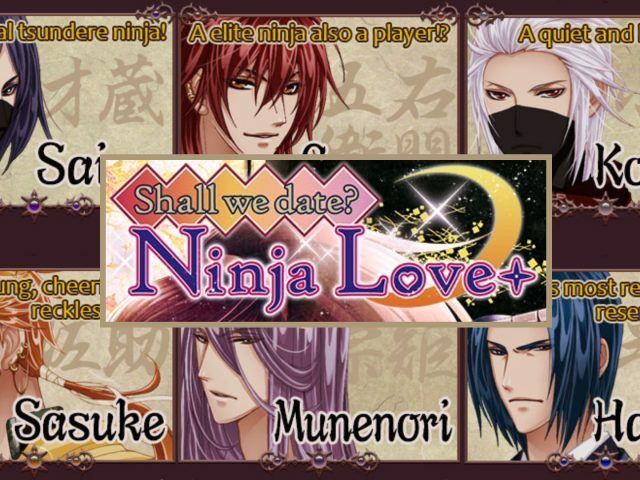 in the romance genre, we were intrigued to see what sort of a romance story would develop from when the male lead character was an AI robot. 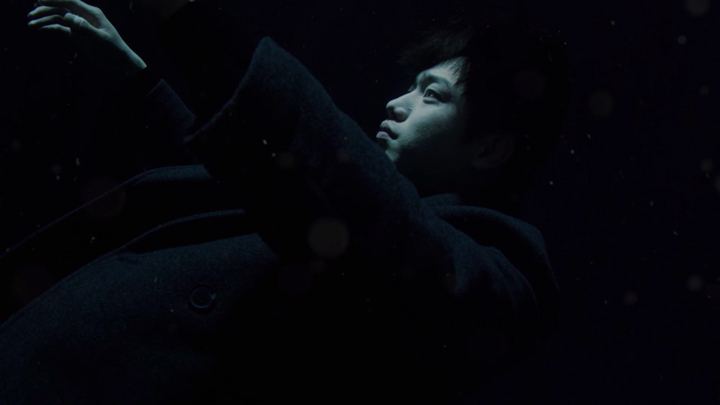 It was interesting to see if the drama would give a happy-ending and have the AI robot exist in the world of humans by the end of the drama even though we didn’t expect for one. There was a lot we saw that could make for an exciting watch in this drama. 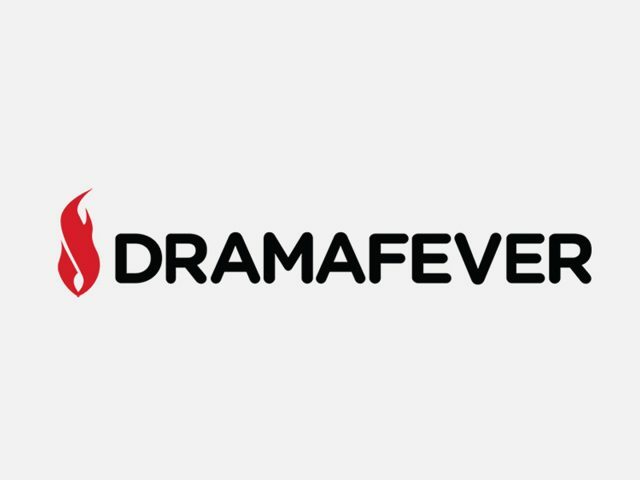 So, we tuned in to see what sort of drama Are You Human Too? will bring! Are You Human Too? centralises around a power struggle between two sides. On one side, there is the 3rd generation heir of a large automobiles corporation and his people. On the other side is a power-hungry and greedy executive and his supporters wanting to make the automobiles corporation theirs. 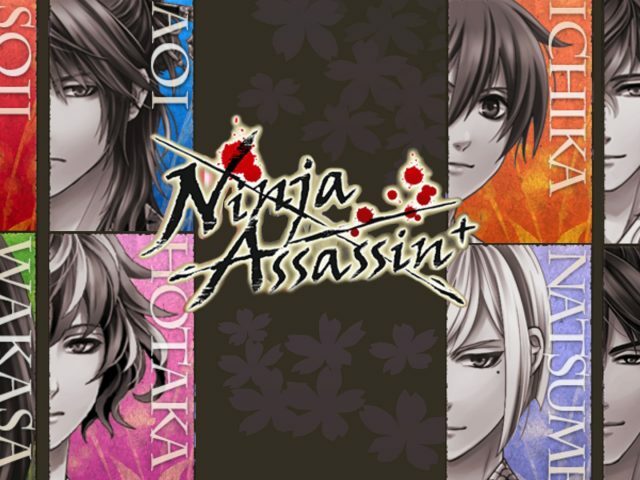 With the power-hungry and greedy executive having such desires, he makes an attempt to eliminate the 3rd generation heir with a carefully planned hit-and-run with intent to kill. Their attempt is pretty good. The 3rd generation heir becomes gravely injured, but not yet eliminated. It’s here that the AI robot comes in and stands in for his human counterpart to deceive the power-hungry executive. The people working for the 3rd generation heir works on getting him out of his comatose state and back to health so to bring him back to being in position to take over the company. 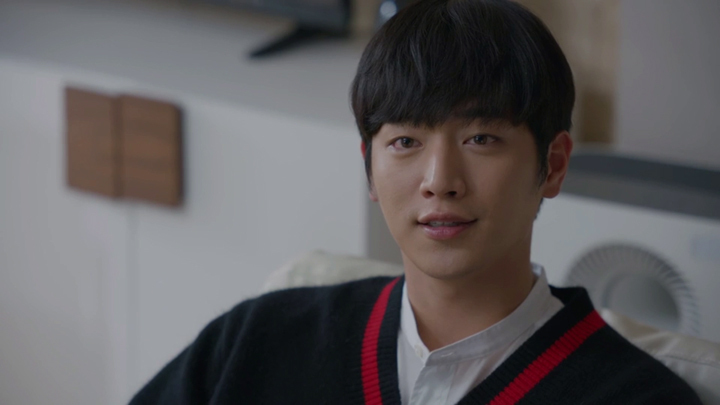 The 3rd generation heir of the large automobiles corporation, PK Group, is Nam Sin (Seo Kang Joon). He’s someone who has neither interest in his family business’ affairs nor the desire to inherit PK Group. He’s seen as rebellious and irresponsible by those around him. From the backstory that was shown, Nam Sin’s unfilial behaviour stems from the event that took place when Nam Sin was a 7-year-old boy during a visit to Korea where his mother had a lecture talking about her field of study on artificial intelligence. Nam Sin was made to live with his grandfather against his will. His grandfather is the chairman of PK Group. Nam Sin was threatened to make his mother believe he wanted to live with his grandfather. His grandfather told Nam Sin that doing so will guarantee his mother’s safety. Nam Sin listened. He expressed hate towards his mother by way of telling her that he blamed her for causing his father to commit suicide—an event that was told to have occurred during this time. Nam Sin’s mother, Oh Ro Ra (Kim Sung Ryung), was then separated from Nam Sin. She returned home back to Czechia while Nam Sin had to live with his grandfather in Korea. The AI robot with the appearance of Nam Sin was created during this period in time. Nam Sin’s mother created the AI robot as means to fill the void that was there of not having Nam Sin near her. Throughout the years, she altered the AI robot’s physical appearance to match her son’s changing appearance as he grew and inputted the personality she felt her son had. By the time the AI robot assumes the role of Nam Sin, he is at version three. 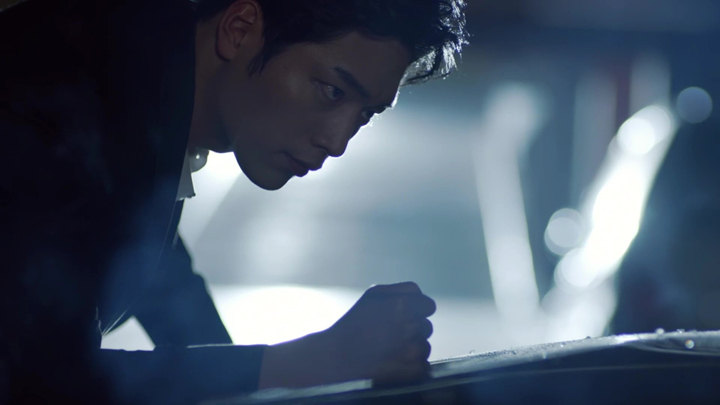 The AI robot’s name is Nam Sin III (Seo Kang Joon). Carrying out the deception successfully required Nam Sin III to go through training in a holographic simulator environment. 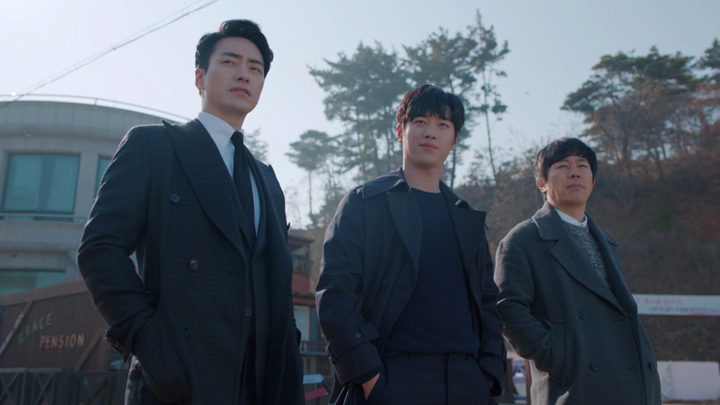 Nam Sin III who is programmed with a warm, friendly and cheerful personality receives training from Nam Sin’s secretary, Ji Young Hoon (Lee Joon Hyuk), on the correct reactions and actions to give to those Nam Sin frequently encounters daily prior to moving him into the live environment. In the beginning episodes, it was about leaking small hints and bringing characters who weren’t in the know to being in the know about the fact that the Nam Sin they were interacting with was not Nam Sin or human. The character we thought would definitely come to be in the know about Nam Sin III, and was the first character to be in the know, was the female lead character, Kang So Bong (Gong Seung Yeon). Kang So Bong is a character that starts off as being a problematic character in the plot to keep the secret about Nam Sin III hidden from the bad guys. The things she did in secret had us feeling anxious. We were agitated by her actions. However, we knew her character would change to one we’d root for when she would come to be on the good side and work alongside Nam Sin III. After all, Kang So Bong is the female lead character. We just had to wait. :oD :oD. Kang So Bong is introduced to us as one of Nam Sin’s bodyguards. She got dismissed for the bad conduct of secretly taking photos of him and handing it to the paparazzi to earn that extra side of money. The paparazzi worker is Reporter Jo (Kim Hyun Sook). 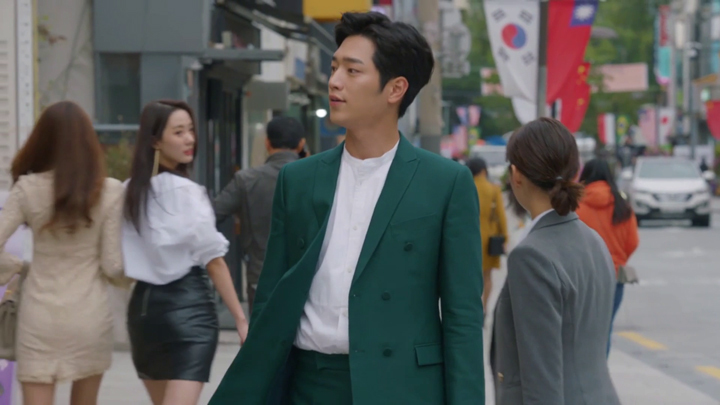 Reporter Jo is someone pretty familiar to Kang So Bong. Kang So Bong comes to be at odds with Nam Sin when she finds out that she had actually been part of a plan of Nam Sin’s of which Reporter Jo was clued in on because she worked on the plan with Nam Sin. This plan of Nam Sin’s was to give him a bad image and make him look unfit to lead PK Group. It also helped him in creating chaos to lose the people keeping watch of him so he could board a flight to Czechia to find his mother to find out the truth about the death of his father—this of which had the outcome of Nam Sin ending up in a coma from being in a hit-and-run accident. The hate Kang So Bong has towards Nam Sin transfers onto Nam Sin III when Nam Sin III stands in for Nam Sin after the hit-and-run incident. 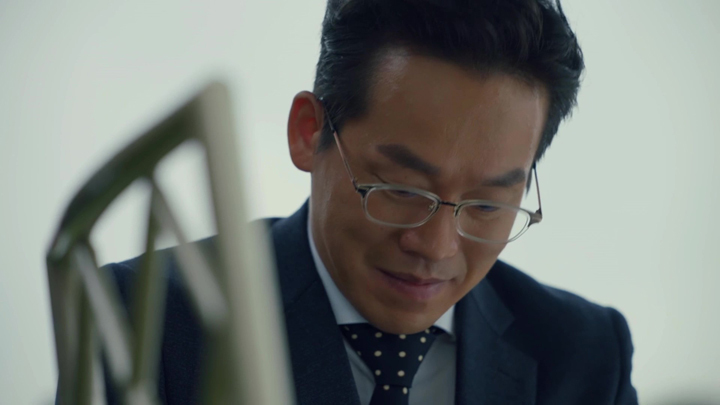 Attracted by the huge sum of money offered to her alongside the hate she has towards Nam Sin, Kang So Bong goes to work for Seo Jong Gil (Yu Oh Seong)—a director of PK Group seeking to have control of the company. Seo Jong Gil is the greedy executive who is the mastermind behind the plan to eliminate Nam Sin with that hit-and-run. 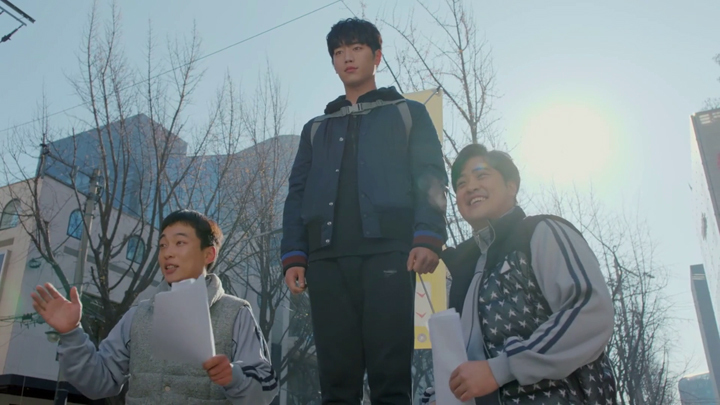 The job Kang So Bong receives from Seo Jong Gil is helping him find out information on Nam Sin with the explanation that he just wants to know the type of person his future son-in-law is. But in reality, it’s Seo Jong Gil’s way of working out the situation of how Nam Sin could be walking around unharmed and perfectly well when the hitman he hired confirmed success of eliminating Nam Sin in the hit-and-run he masterminded. Kang So Bong comes to be Nam Sin III’s personal bodyguard and she resides in a room in the Nam residence. This makes for a bit of a nerve-racking watch with Kang So Bong having the opportunity to discover the secret as she has access to Nam Sin III 24/7. We see Kang So Bong implanting a hidden camera in a robot figurine in Nam Sin III’s room which caught a conversation between Nam Sin III and Ji Young Hoon talking about being better in acting as Nam Sin; she comes to see a glimpse of the real Nam Sin; Nam Sin III, himself, provides hints he’s not the real Nam Sin with odd responses such as not having a heart and not feeling anything. These moments fortunately don’t lead to uncovering the secret about Nam Sin being an AI robot. 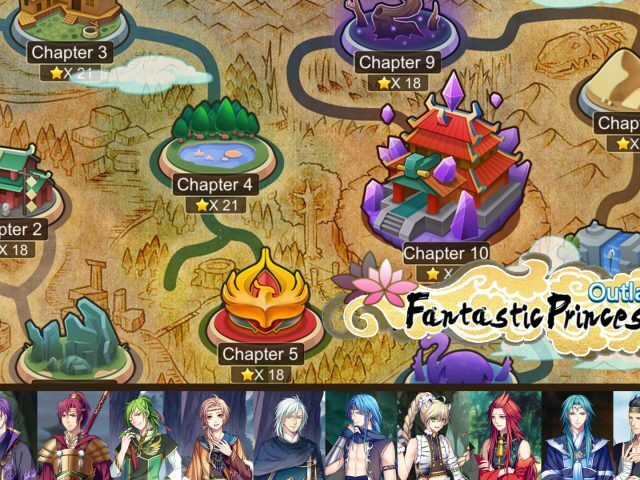 However, the antagonists in the story show to always be extremely alert and ready to uncover this secret. They never seem to miss catching onto odd happenings around Nam Sin III and finding things to be not quite right. The bad guys are always investigating and annoyingly keeping up their persistence in getting what they want. The nerve-racking action with the bad guys catching onto Nam Sin being an AI robot do let up around the middle point of the series, though. This is when the fact of Nam Sin III being behind the act of Nam Sin isn’t much of a nerve-racking secret to be revealed. 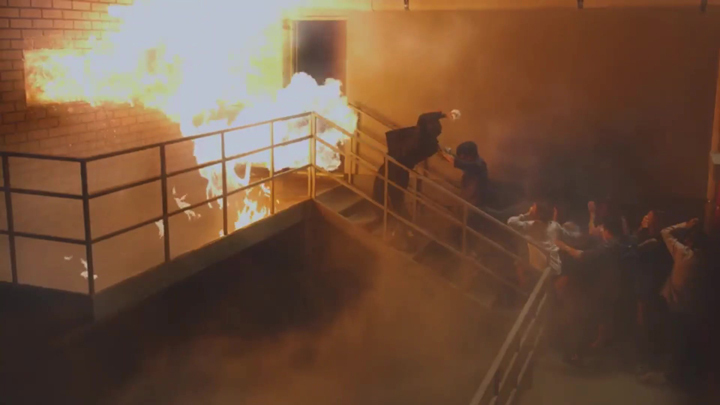 One of the cool action scenes in Are You Human Too? is when Nam Sin III goes into Disaster mode (Episode 4 & 5). A flash of red in Nam Sin III’s eyes show a change in his state to Disaster mode. The end of the state is also indicated in this way. When Nam Sin III is in Disaster mode, it’s told that a lot of unnecessary functions are shutdown and those operational are ones assisting him in saving lives. He seeks people in danger, clears obstacles and brings them to safety. When Nam Sin III is in this state, he functions like an automaton without recognition of anyone. The event bringing Nam Sin III to go into this mode is at a PK Motors evening party. The fire began with alcohol bottles left unattended with sparklers attached and lit. The owners of the bottles and sparklers were a few young females who Kang So Bong had warned about the danger the sparkler posed, but was ignored. A fire then breaks out. Cooks in the kitchen make a quick exit from the kitchen without shutting off their cooking equipment. This most likely added to the spread of smoke and flames that quickly fill the venue. Panicked people seek routes of escape, but obstacles prevent them from reaching exits or they reach them, but they aren’t able to open them. Nam Sin III, off-site at the time dealing with Reporter Jo, goes to the scene of the blaze after someone informed them of it happening across the street. The fire and medical services have already arrived. Escapees are on the ground coughing with a handful more function goers managing to escape the burning venue. Disaster mode activates in Nam Sin III after a moment surveying the scene. After flinging Ji Young Hoon out of his way with an arm, Nam Sin III begins scanning. He classifies the people he finds as either in danger or stable. He assists those who are unconscious and instructs those who are able to save themselves to get themselves to safety. In the midst of the danger, there’s a brief moment where time stands still for Kang So Bong after Nam Sin III brings her into his arms. The gaze Kang So Bong receives from Nam Sin III in Disaster mode makes her heart race. This is a moment Nam Sin III hints he’s not human. 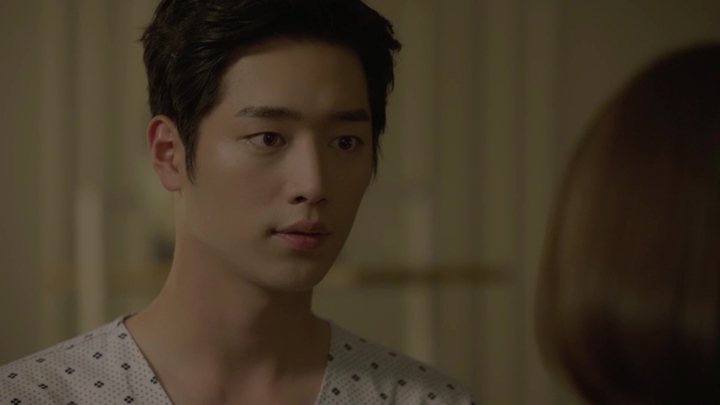 “I don’t have a heart,” he says after Kang So Bong says that sound of a heart racing belonged to him and not hers. By the time Nam Sin III carries Kang So Bong out of the burning venue, there’s 2% of battery life left. 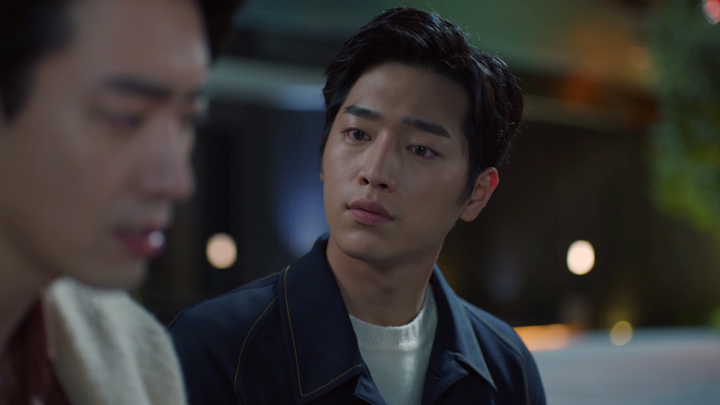 It becomes a moment that has a huge potential for people finding out that Nam Sin was an AI robot: a moment of interaction with Kang So Bong after coming out of Disaster mode, Nam Sin III stops operating. 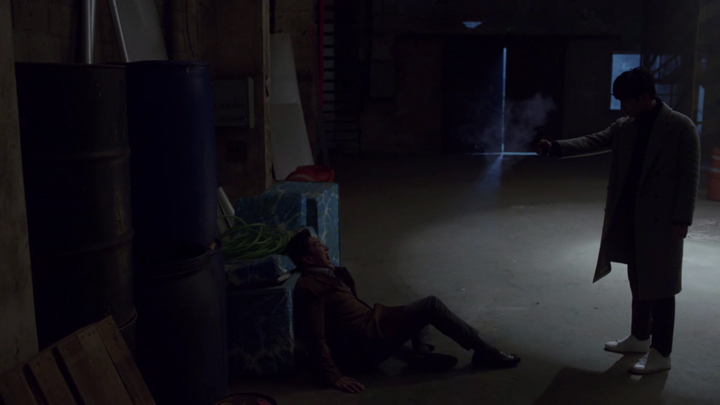 He freezes in his crouched position with circuitry in his back exposed. 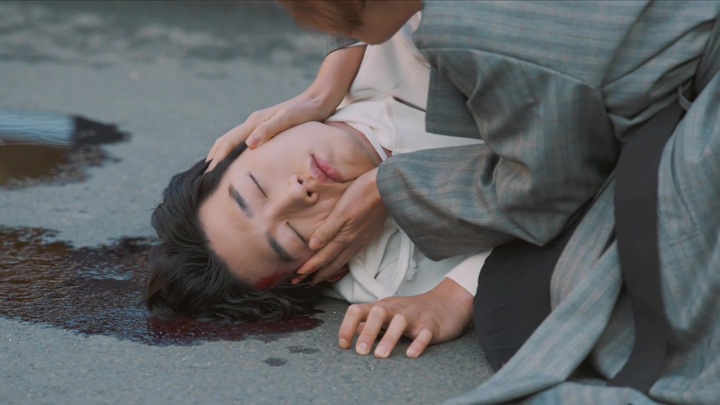 Reporters are alerted to this scene when Kang So Bong calls the medics for assistance. Fortunately, Ji Young Hoon was in the vicinity. He shields the exposed circuitry with his jacket. The outcome of this event is Nam Sin III’s people managing to continue to keep their secret operation hidden. In an event where PK Motors demonstrates their newest car—a self-driving car—to the public and the press, Nam Sin III uses his superhuman being to gain control of the self-driving car. PK Motors’ self-driving car cruises well on the streets for a bit of time before it begins creating havoc. It cuts in front of cars, goes up curbs and brings accidents to other cars. 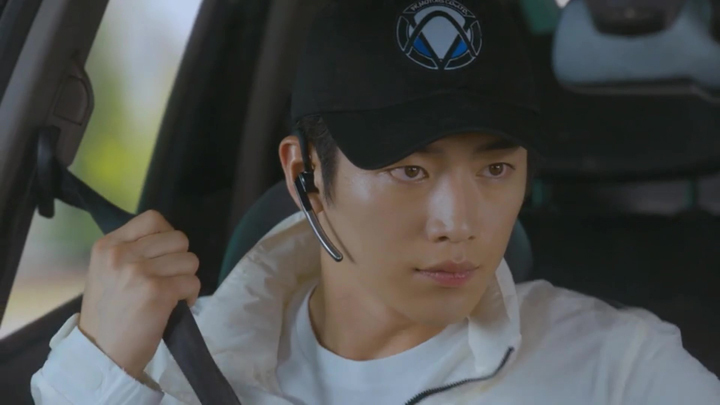 The self-driving car is in the control of a skillful hacker hired by Seo Jong Gil (Episode 7 & 8). This was Seo Jong Gil’s way of making Nam Sin / Nam Sin III look incompetent by having him fail on his word of seeing through a successful demonstration of PK Motors’ newest product. Nam Sin III goes to try bringing the self-driving car back to driving safely. He attempts to access the systems of the self-driving car from where he is seated. This was from within the car Kang So Bong drove and was where Nam Sin III and Kang So Bong observed the self-driving car from. For a brief moment, Nam Sin III manages to gain access to the systems of the self-driving car. He decelerates the car. However, the hacker regains control and the self-driving car continue creating havoc. Nam Sin III decides the only way to stop the car is getting into the self-driving car and stopping it from within. He asks Kang So Bong to get their car side by side with the self-driving car so he can enter into it. 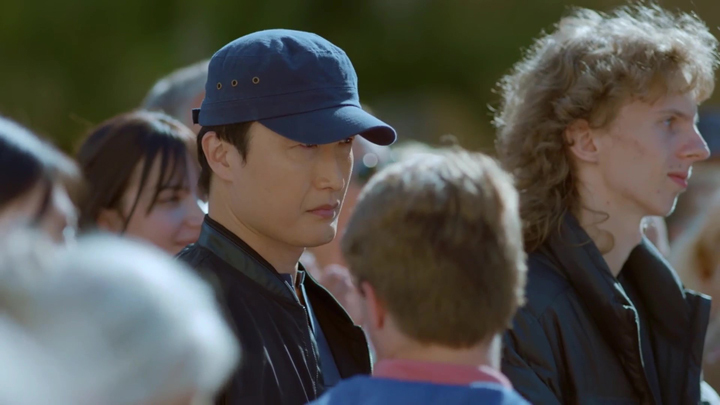 Kang So Bong isn’t able to see how he is able to get into a car that’s on the move. Nam Sin III manoeuvres the car right against the self-driving car himself. With this move, Kang So Bong thinks ‘Nam Sin’ is crazy. Nam Sin III comes with another hint of him not being human. When Nam Sin III hits a button to open the sunroof and Kang So Bong asks if he’s not scared, he says he doesn’t understand such things; he doesn’t have emotions. Through the sunroof Nam Sin III goes. He leaps over to land on the roof of the self-driving car. With the front passenger seat door previously detached and ejected from the car by the hacker, Nam Sin III makes his entrance into the car through this opening. He sees a device situated on the dashboard. This is a device known as the ‘kill switch’. It is something that can stop the car from driving itself and allow driving to occur manually. Nam Sin III goes to hit the kill switch. However, he’s stopped from managing to press it when he gets thrown out of the passenger door opening as a result of a sharp jerking action that the self-driving car makes. We see sparks flying from friction between Nam Sin III’s body and the concrete road as Nam Sin III maintains hold at the corner edge of the car’s door frame. It takes Nam Sin III a couple of moments before he is able to bring himself back into the car. He manages to hit the kill switch this time and gains control of the self-driving car. This event comes to be one that brings Kang So Bong to find out about Nam Sin being an AI robot. 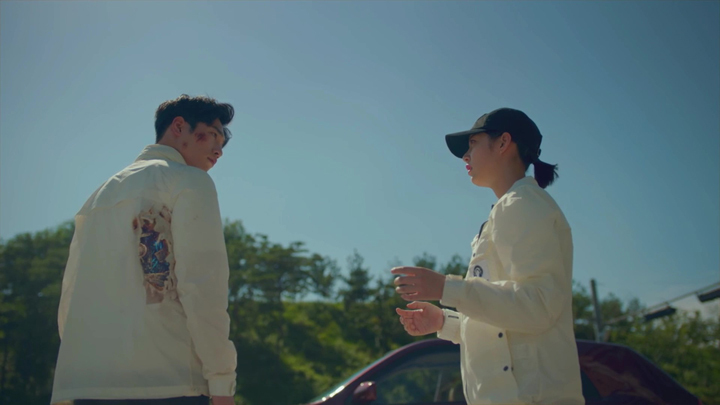 After Nam Sin III evades one final danger of impacting with a truck fast coming into his path with manoeuvring the self-driving car parallel to the truck’s line of path, Kang So Bong gets out of her car and checks Nam Sin III’s body to make sure he isn’t hurt anywhere. Checking Nam Sin III’s body, she finds exposed circuitry in his back. Kang So Bong’s initial reaction to finding out about Nam Sin being an AI robot was fear. She tried escaping from Nam Sin III and his people any time she wasn’t hindered. It required Nam Sin III to stop her from escaping and hold her by force to bring her to see the condition the real Nam Sin was in so to bring her to understand why there was such a nonsensical secret operation as an AI robot with Nam Sin’s appearance pretending to be Nam Sin. 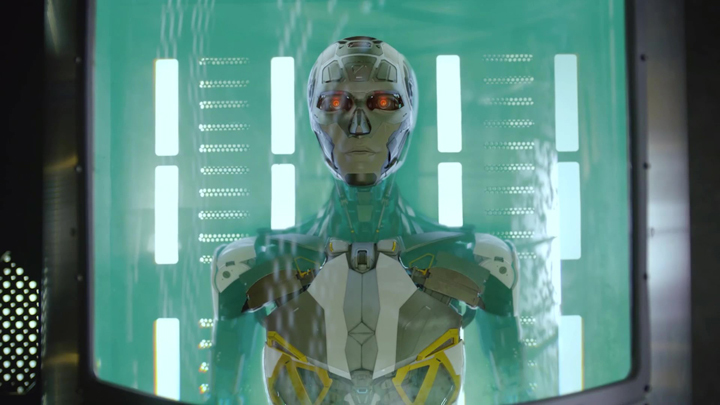 Nam Sin’s mother is the one to bring Kang So Bong into understanding the situation of an AI robot pretending to be Nam Sin. She shows Kang So Bong the condition the real Nam Sin is in. 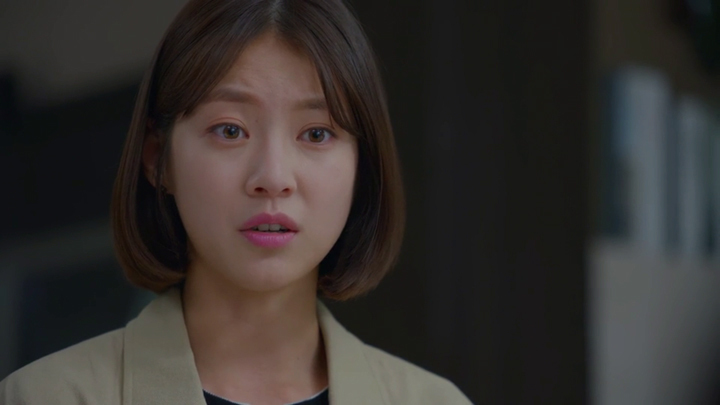 She tells Kang So Bong that the person she’s working for is responsible for the car accident that has brought Nam Sin to be in this comatose state. That’s Seo Jong Gil. Nam Sin’s mother makes a desperate plea to Kang So Bong to cooperate with them and not let out this secret. She goes on her knees and asks Kang So Bong to help her and Nam Sin keep their secret. Kang So Bong shows herself to be extremely uneasy about being involved in this secret operation of an AI robot pretending to be Nam Sin. She doesn’t indicate whether she will cooperate or not at the moment Seo Jong Gil calls her wanting information on what happened out on the road with the self-driving car. We come to see Kang So Bong does choose to cooperate when she doesn’t let out what she’s learnt to Seo Jong Gil. She continues to live in Nam Sin’s place and remains as Nam Sin III’s personal bodyguard to keep up appearances as to not cause suspicion she has found interesting information regarding Nam Sin. 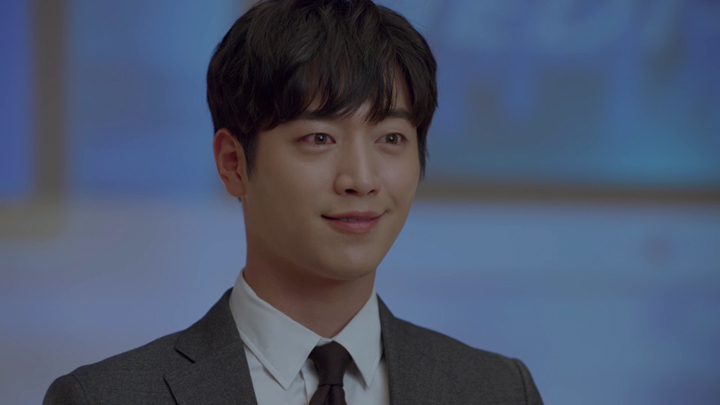 However, continuing to be around an AI robot who looks very human-like and acts very human-like isn’t an easy thing for Kang So Bong. The sound of Nam Sin III’s voice makes her jumpy and contact with him makes her snap away from the contact immediately. This uneasiness Kang So Bong feels around Nam Sin III brings her to decide to leave the place. 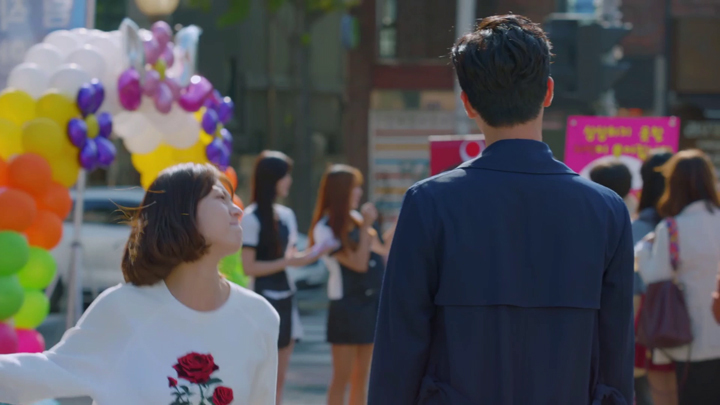 However, when Ji Young Hoon goes to her and thanks her for making a difficult decision that allowed him to finally have a good night’s sleep, she decides she can’t leave then and there. Kang So Bong decides to leave again when she feels the probability of their secret coming out has increased. She isn’t able to continue on for the fear of the consequence that would come for her involvement in the secret operation. 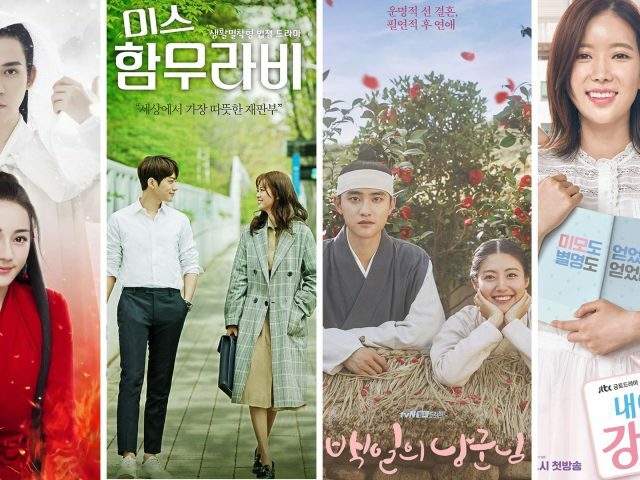 The announcement of Nam Sin’s engagement to Seo Jong Gil’s daughter, Seo Ye Na (Park Hwan Hee), makes Kang So Bong pack up and leave (Episode 9 & 10). Nam Sin III manages to change Kang So Bong’s mind, however. 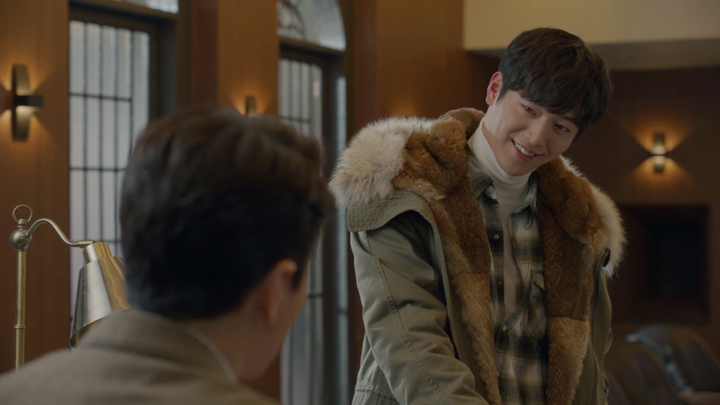 He succeeds in this after he makes Kang So Bong recall two occasions where he helped her out in a major way and she agrees to stay and return the favour. She recalls Nam Sin III saving her from being trapped inside a burning building (Episode 4 & 5). She also recalls him helping her find her mother’s necklace which she had lost into his pool after jumping in thinking he was in trouble (Episode 7 & 8). 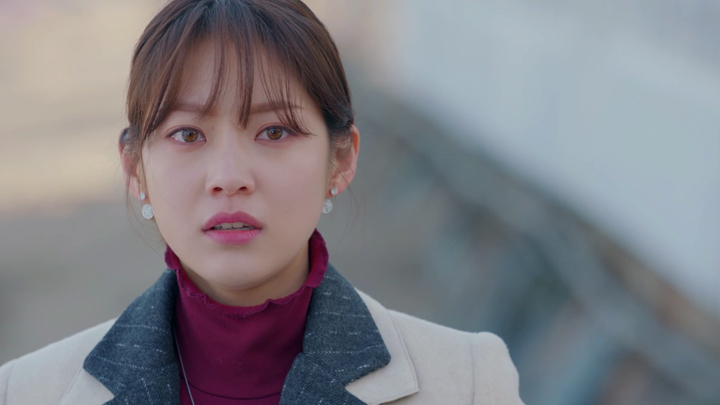 Kang So Bong recalling these two past moments comes after Nam Sin III had asked her to help him out with making sure no others have the chance to experience the shock, fear and disgust that she felt when she found out about him being an AI robot. This was through Nam Sin III asking for her help with preventing him from making any mistakes that would reveal him to be an AI robot. 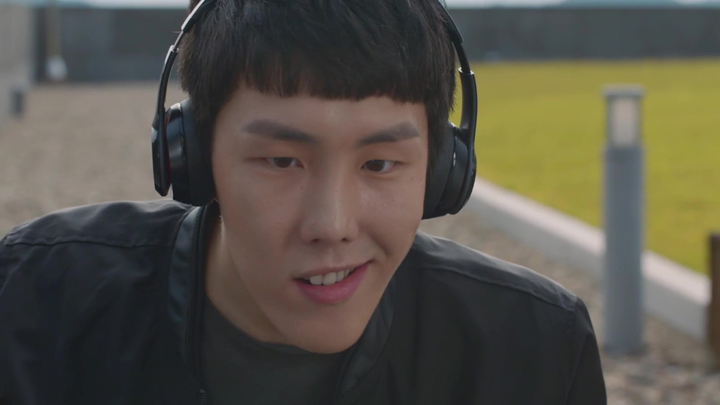 “I’m a pretty cool human, right?” This is what Kang So Bong had asked Nam Sin III (Episode 15 & 16). She is. Kang So Bong develops into an extremely awesome character after she comes to help Nam Sin III. She becomes his first human friend and provides him company that we found him lacking before Kang So Bong came into knowing about Nam Sin being an AI robot. Previous to Kang So Bong knowing his identity, Nam Sin III’s only friend was his household automatic vacuum which had a personality of a loyal pet dog. He came across as pretty lonely with no one he could talk to and be himself with. As Nam Sin III’s friend, we see Kang So Bong looking out for him and reacting to when people dismiss him or treat him with disrespect. Seo Ye Na is someone who comes to find out about Nam Sin III. Her love and loyalty towards the real Nam Sin has her choose to keep the secret from her father, Seo Jong Gil. Seo Ye Na is great in this respect. However, she isn’t so great when it comes to treating Nam Sin III well. Her actions are rude. She dismisses him as an object that she can make stand in a corner and face away from her because his face that is an exact mirror of the real Nam Sin disgusts her. She also doesn’t hesitate to deactivate him when he gets on her nerves. (Episode 13 & 14). 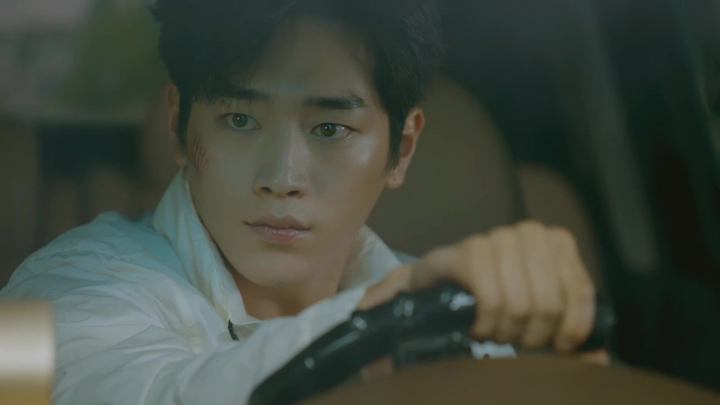 The occasion where we see Seo Ye Na deactivating Nam Sin III is during a car ride where Nam Sin III sits in the backseat with Seo Ye Na and Kang So Bong is their chauffeur. Nam Sin III annoys Seo Ye Na with him continually choosing to listen to Kang So Bong and not Seo Ye Na. 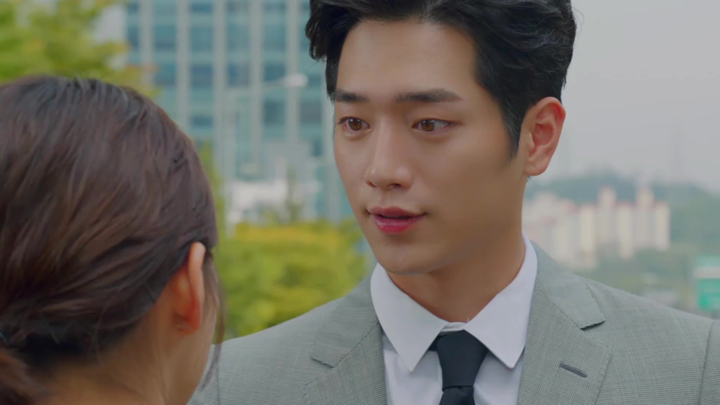 He looks to Kang So Bong for instructions before proceeding with any of Seo Ye Na’s commands. The window that he opened after Kang So Bong asked Seo Ye Na if she wanted it opened because she looked uncomfortable, he doesn’t close it when Seo Ye Na tells him to close it. 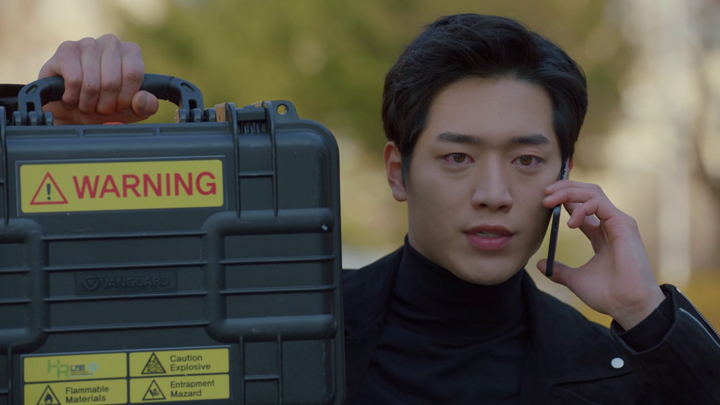 He closes it only after Kang So Bong instructs him to close it. He doesn’t take off his engagement ring that Seo Ye Na commands him to take off. That’s because Kang So Bong didn’t give him any indication that he should take it off. 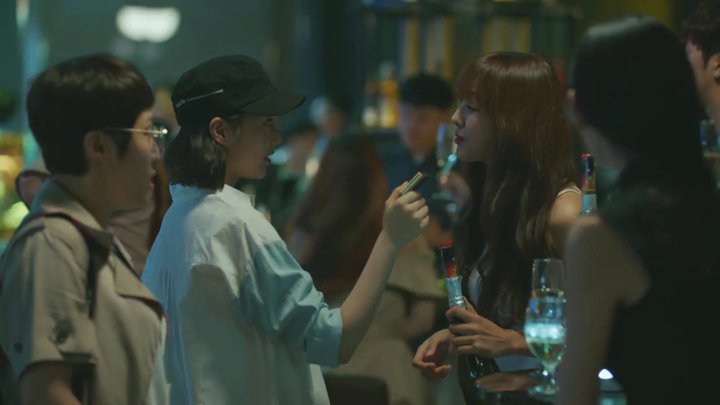 Kang So Bong only told Seo Ye Na to not act the way she was acting. The engagement ring gets pulled off his finger and thrown to the ground by Seo Ye Na. Nam Sin III picks the engagement ring up and puts it back on. It’s after this that Seo Ye Na deactivates Nam Sin III to deal with his presence that was annoying her. She rips the battery out of Nam Sin III’s wristband and he shuts down. Seo Ye Na deactivating Nam Sin III insults Kang So Bong. She stops the car and goes around to Seo Ye Na’s side to tell her to not treat Nam Sin III like this. Nam Sin III has a brain and can read human emotions. 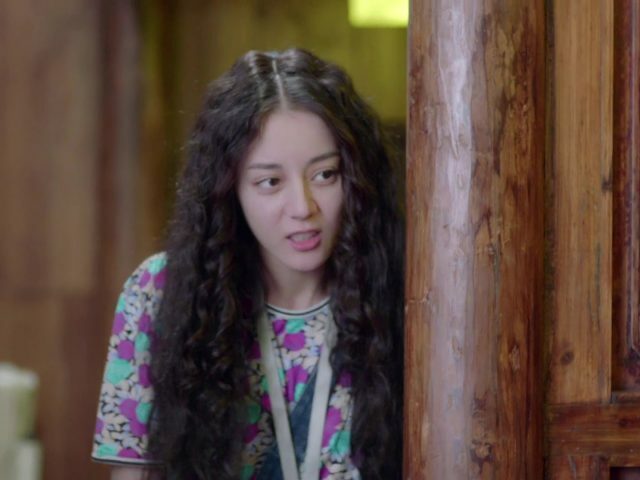 Seo Ye Na mocks Kang So Bong for the care she shows towards Nam Sin III. Seo Ye Na wonders if she has fallen for him just because of having been kissed by him (Episode 9 & 10). Kang So Bong ignores the comment made to infuriate her. She goes over to Nam Sin III’s side with his battery and places it back onto the wristband for him. Seo Ye Na goes to try removing it again, but Kang So Bong stops her with restraining her with a hold of her wrist. Nam Sin III powers back up and hears words of care from Kang So Bong: he’s dead if he ever lets anyone touch his battery again. We see those words from Kang So Bong come to have a huge impact on Nam Sin III. 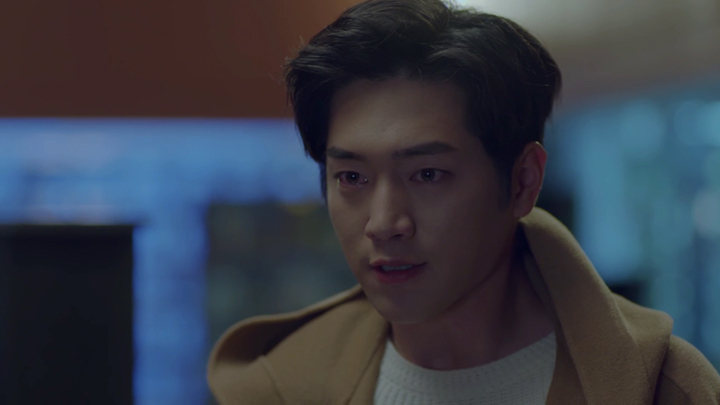 When Seo Ye Na goes to mistreat Kang So Bong, he reacts in an unexpected and uncharacteristic way. 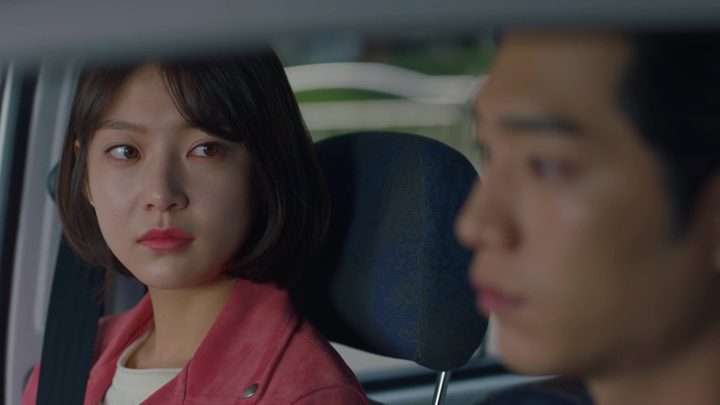 Seo Ye Na—a superior that Kang So Bong should act respectfully towards—has Kang So Bong follow her to have a talk with her some distance away from the car. Kang So Bong receives a slap across the face for speaking to her in the way she did and referring to her as ‘anyone’. Seo Ye Na strike again with a retort from Kang So Bong saying she was nothing without Nam Sin or her dad. 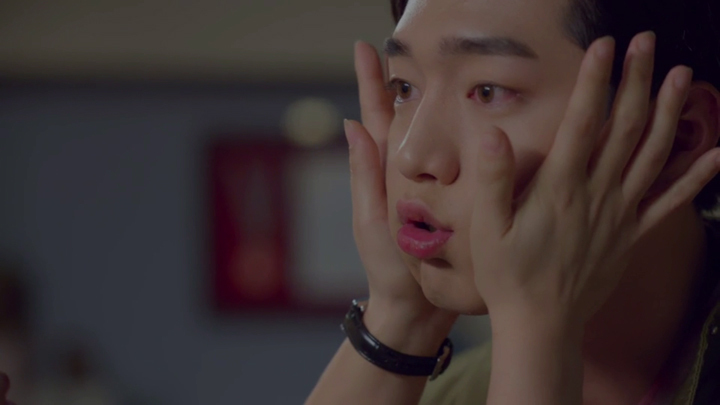 Kang So Bong is aware this time and doesn’t allow the hand to meet her face. 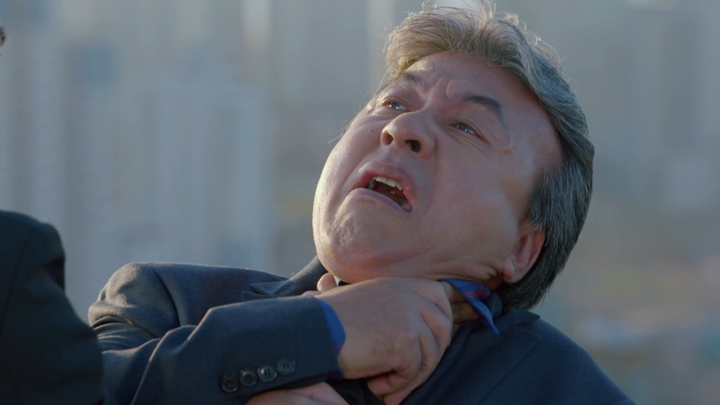 Kang So Bong restrains Seo Ye Na with a hold on her wrist. 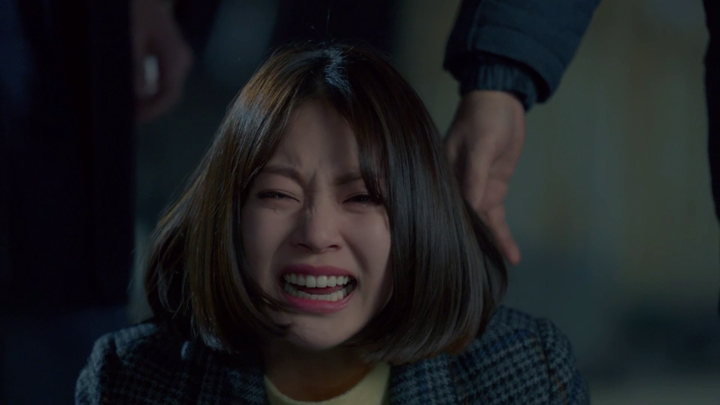 Not able to overpower the hold Kang So Bong had on her wrist, Seo Ye Na attacks Kang So Bong’s knee. This brings Kang So Bong to immediately release Seo Ye Na as she falls to the pain in the knee Seo Ye Na kicked. 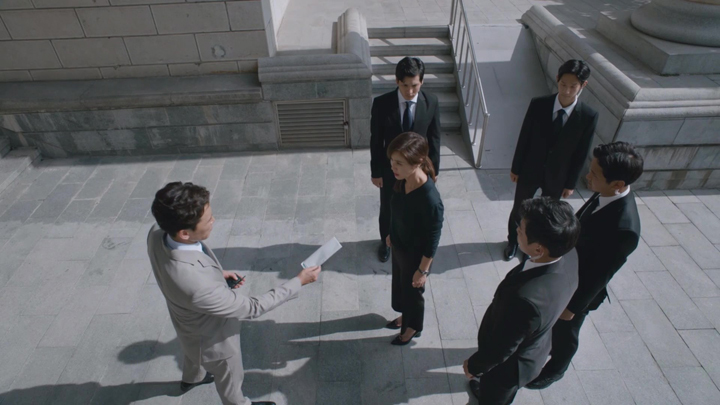 Seo Ye Na goes to give one more strike at Kang So Bong. This one gets stopped by Nam Sin III. 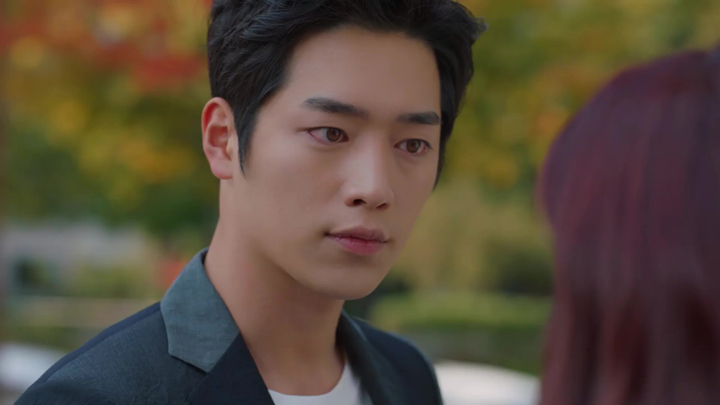 He tells Seo Ye Na to not mistreat Kang So Bong. 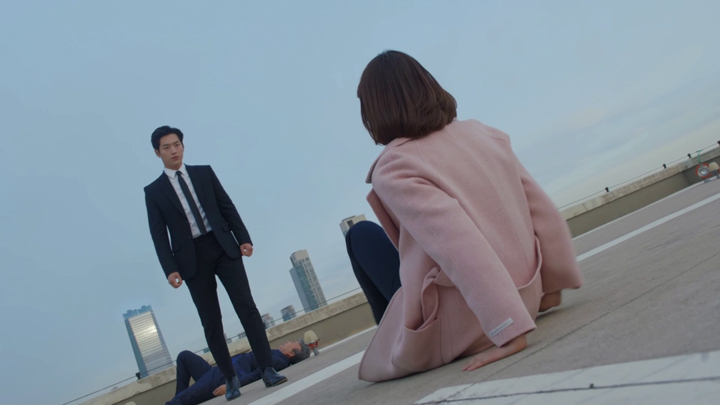 When Seo Ye Na doesn’t listen because he is in no position to order her, Nam Sin III makes Seo Ye Na hit the ground with a shove and release of his hold on Seo Ye Na. A moment standing with an indifferent expression looking upon Seo Ye Na looking up at him incredulously, Nam Sin III goes to Kang So Bong. He helps her get up from the ground. This interesting and uncharacteristic behaviour is in light of a new rule Nam Sin III inputs into his programming during this moment. 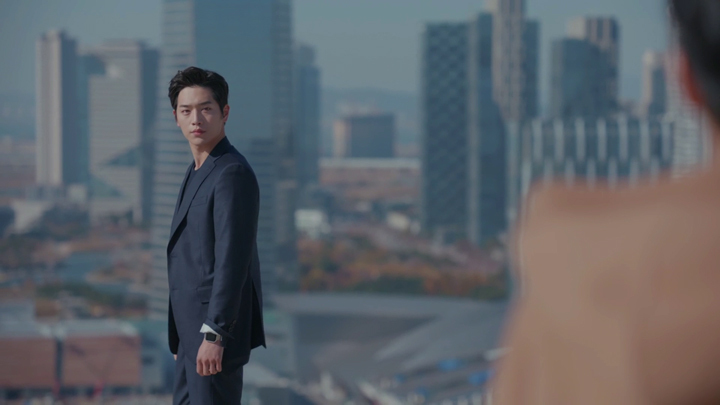 He says to Kang So Bong that protecting her is now his top priority. 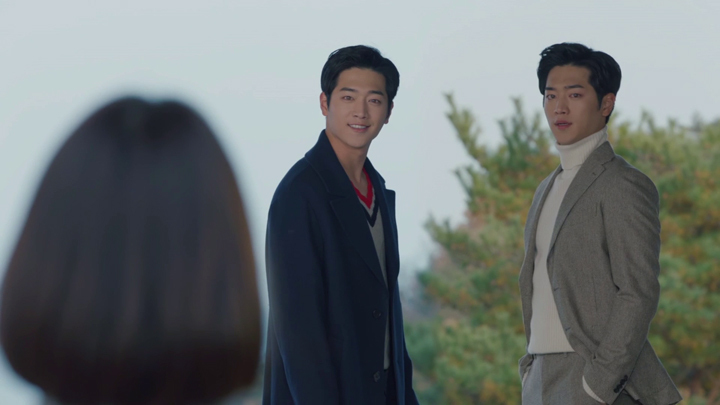 Kang So Bong being Nam Sin III’s top priority seems to see him notice even moments like when Kang So Bong has to apologise for something she has no fault in. During a trip to a wedding dress store accompanying Seo Ye Na to try on wedding dresses, a sales representative directs Kang So Bong the prejudice she has towards regular folks. This being that regular folks have a tendency to snap pictures of their wedding dresses. They snap pictures so they can copy the designs of the store’s wedding dresses that they can’t afford to buy. (Episode 15 & 16). The dress Kang So Bong wanted to take a picture of, but was warned that taking photos are prohibited at their store, is the one Nam Sin III picks out for Seo Ye Na to try on. Seo Ye Na asks the sales representative to give them a moment alone. Once alone, she asks for a picture to be taken of her in the wedding dress. Nam Sin III doesn’t move to take a picture because taking pictures of the store’s wedding dresses is not allowed. Kang So Bong caters to Seo Ye Na’s want, though. 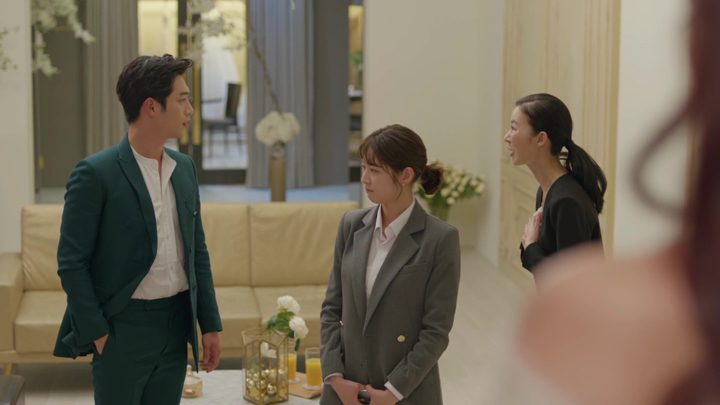 When the sales representative returns and sees Kang So Bong taking pictures, she gets lectured for humiliating her superiors after Seo Ye Na feigns innocence. She tells Kang So Bong to behave according to the standards of her superiors. She will let her off this time. However, she must watch her behaviour. Kang So Bong can do nothing but apologise. 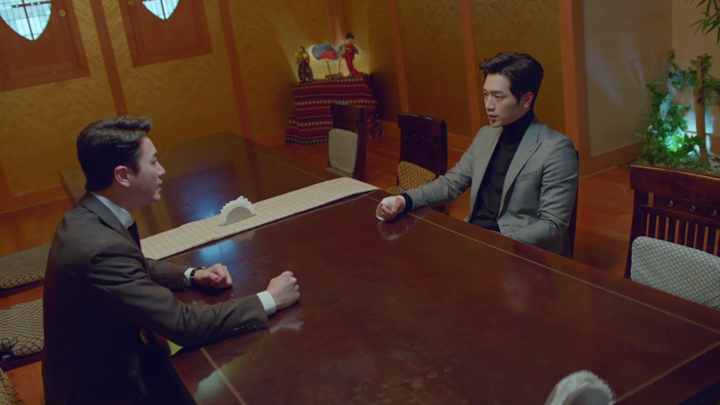 Nam Sin III comes in to correct the unfair treatment upon Kang So Bong with taking the reprimand into himself. 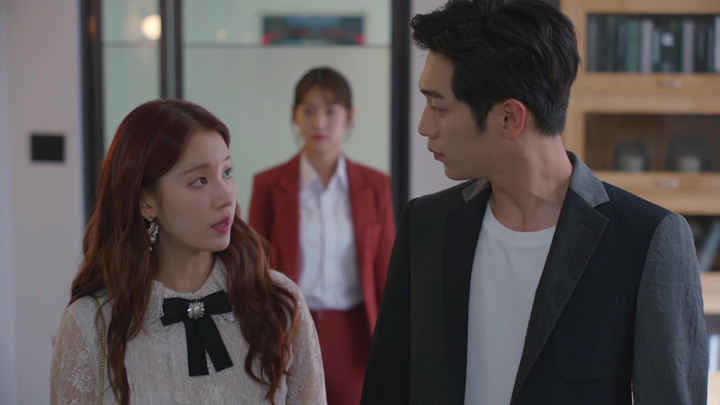 He asks the sales representative what Kang So Bong has to be sorry for when it’s he who asked for a picture to be taken of his beautiful bride in the wedding dress. He asks the sales representative whether her warning to ‘watch your behaviour’ was directed towards him. The store’s rule of taken photos being prohibited seems to not apply to VVIPs as Nam Sin is classed as. The sales representative quickly retracts the warning, apologises and says he can take as many pictures as he wishes to. 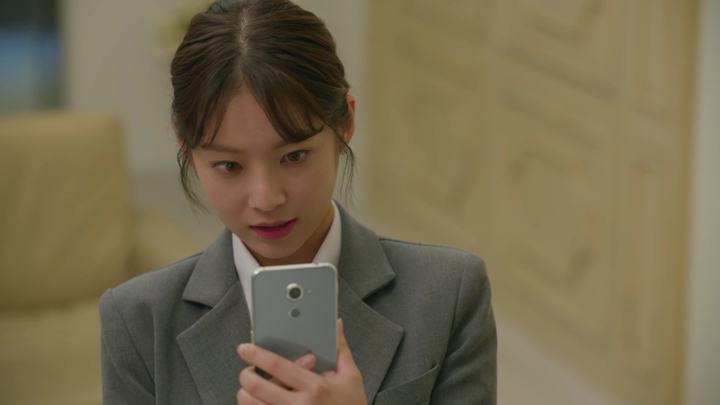 She goes to help him take some for him with Kang So Bong’s phone. The store rule of no taking pictures is a stupid rule, she says. 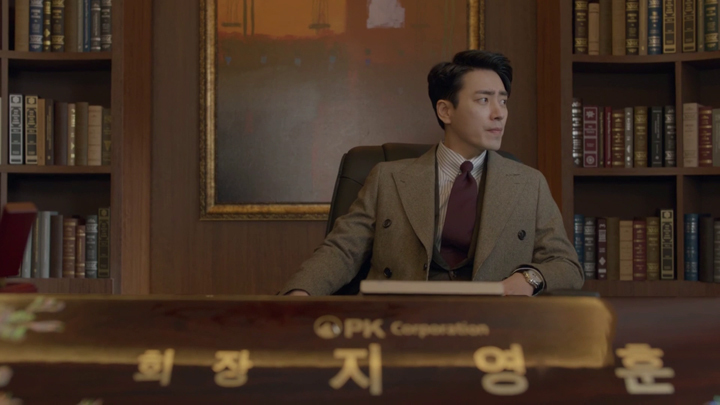 This new rule of Kang So Bong being top priority has Nam Sin’s mother experience a change in Nam Sin III that makes her concerned an error is in his programming. However, it’s simply Kang So Bong seeing Nam Sin III as someone who is his own person and not an AI robot that just takes commands from humans. 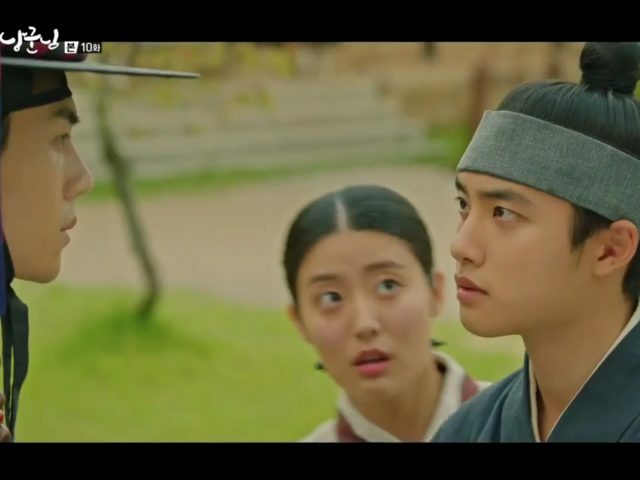 She says he should do what he thinks is right and Nam Sin III listens to Kang So Bong. Nam Sin III makes his own judgements during a meeting discussing chip technology. Nam Sin’s mother proposes PK Motors research and develop their own chip technology for their products. 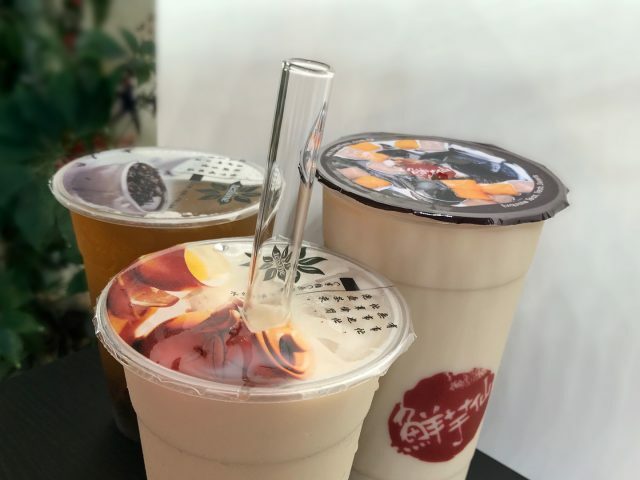 Seo Jong Gil, however, finds that this was unnecessarily wasteful in time and resources when they could just sign a contract and use the chip technology of the company Nam Sin’s mother propose they work with in developing PK Motors’ own chip technology. 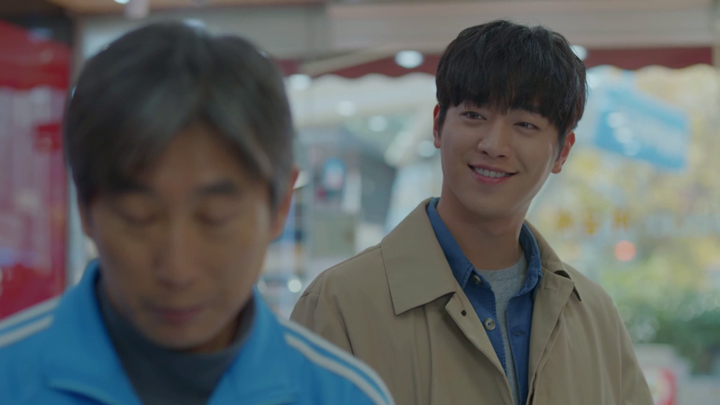 Nam Sin III surprises his mother when he agrees with Seo Jong Gil’s suggestion of purchasing an existing chip technology over her idea of developing their own. 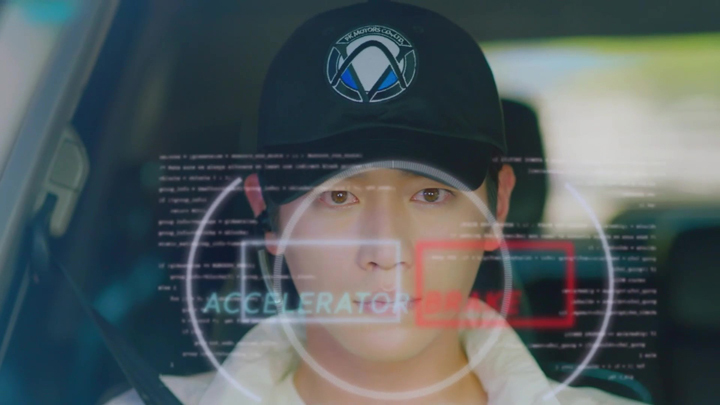 He argues that Seo Jong Gil’s idea was economical and effective in turning around the negative perception of the company following the company’s failed self-driving car showcase. His mother’s proposal to research and develop their own chip technology has the issue of the time required to develop the product. 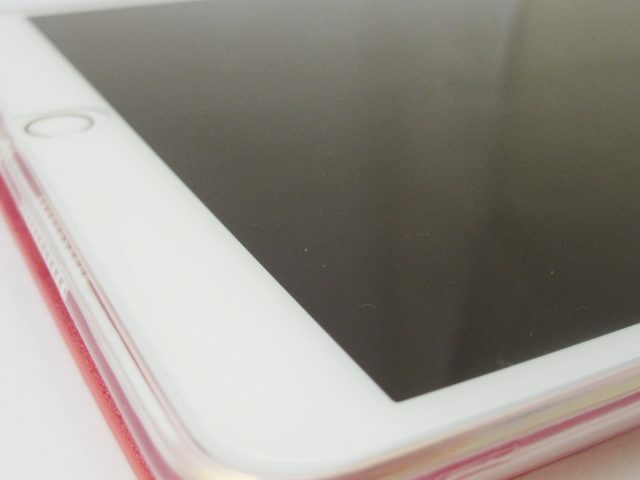 Nam Sin’s mother informed the time it’d take to see the product come out would be six-months. Six months, Nam Sin III says, is a length of time that is too long. It won’t do anything to turn around the public’s negative perception of the company caused by the failed showcase of their self-driving car (Episode 17 & 18). This change in Nam Sin III, his lack of obedience, has Nam Sin’s mother wish to input a device to enable her to manually override and take control of him whenever necessary. Nam Sin III agrees to allow the device to be installed. 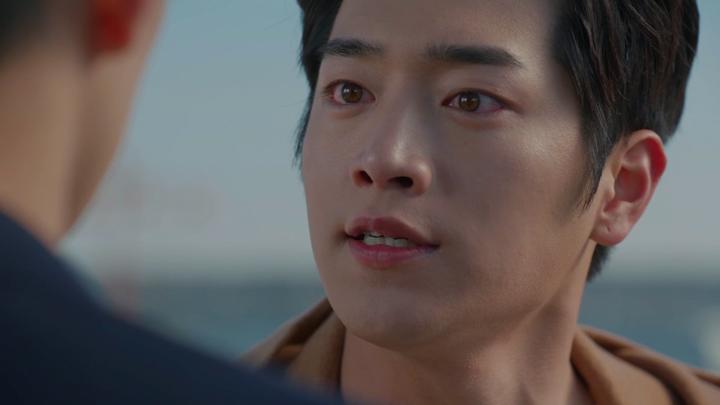 This comes to be possible only after Kang So Bong tells Nam Sin III to listen to his mother and retracting her words of saying he should do what he feels is right. The manual control device gets installed in his wristband on the day of his and Seo Ye Na’s wedding. The manual device doesn’t stay on Nam Sin III for long when he goes according to his own judgement again. 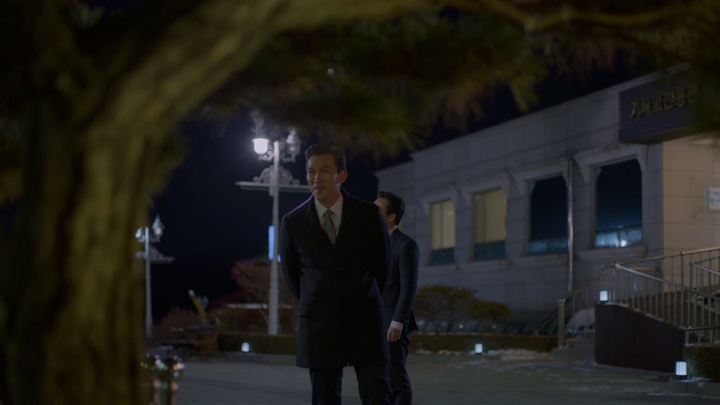 He ran out on his own wedding after he spotted Seo Jong Gil and his subordinate, Secretary Park (Cho Jae Ryong), acting suspicious and immediately headed to Kang So Bong. 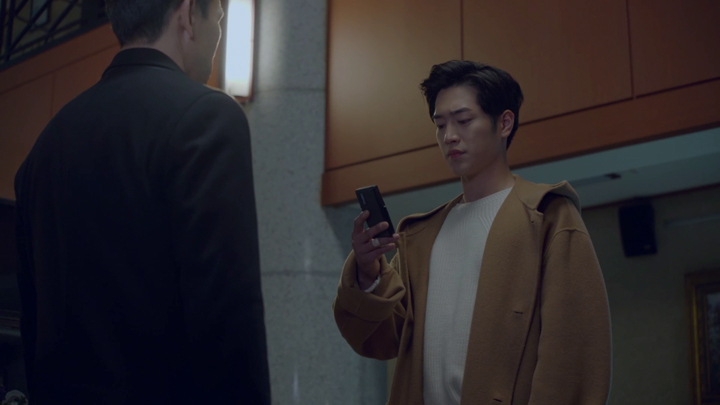 What Nam Sin III spots is Secretary Park putting his mother’s phone back into her bag and he finds Seo Jong Gil acknowledging Secretary Park completing the task. 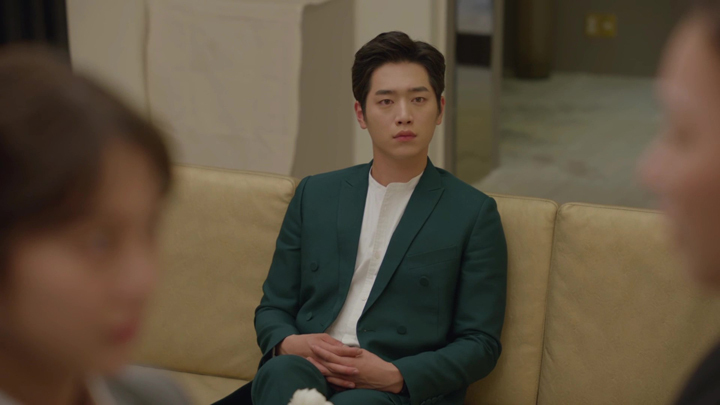 At this point in the drama, Seo Jong Gil gets close to knowing something is not quite right about the Nam Sin he was interacting with. 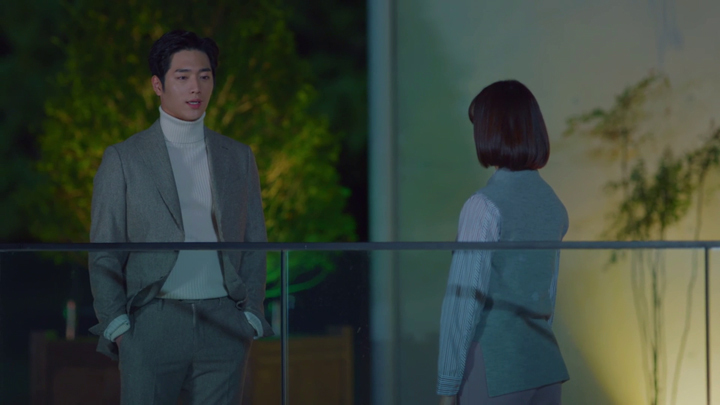 He feels Kang So Bong knows something and she’s not telling him. Secretary Park had used Nam Sin’s mother’s phone to send a message to Kang So Bong. It’s a message that faked the worry Nam Sin’s mother had about a file that revealed the secret and it asked Kang So Bong to help retrieve it. This was a plan to capture Kang So Bong to get her to reveal the secret Seo Jong Gil feels Kang So Bong knows. 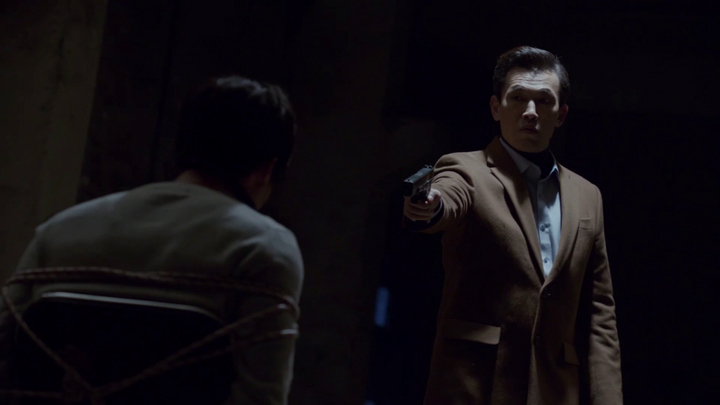 Seo Jong Gil’s hitman is there to capture Kang So Bong. She gets forced into the trunk of his car. She is scared each time there is a rough bump or a knock from the car’s unpredictable movements. The car’s unpredictable movements are caused by the hitman attempting to manoeuvre away from PK Motors’ self-driving car. No matter where the hitman goes to exit the car parking lot, the self-driving car is there to block his attempt to exit. The self-driving car is Nam Sin III. Nam Sin III by extension of the self-driving car blocks the hitman until Nam Sin III, himself, is able to be on location to block the hitman’s attempt to escape. 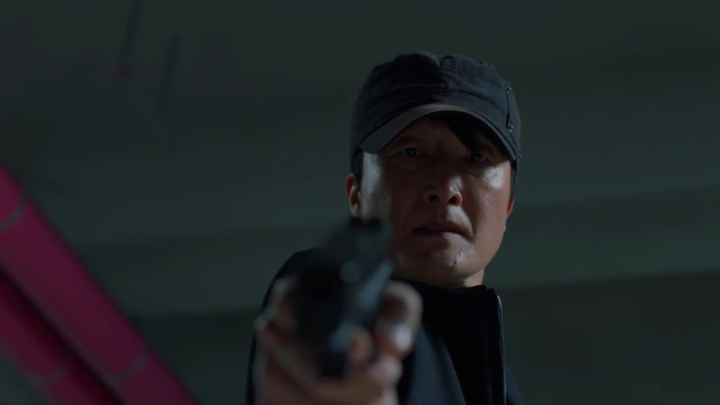 Nam Sin III stops Seo Jong Gil’s hitman escaping with Kang So Bong with a single fist to the hood. It blows out the tyres and renders the car to be no longer able to be driven any further. When the trunk is opened, Kang So Bong is very afraid. When she finds that the person who had opened the trunk is Nam Sin III, she is beyond relieved. She cries. Nam Sin III brings Kang So Bong to him and comforts her (Episode 19 & 20). 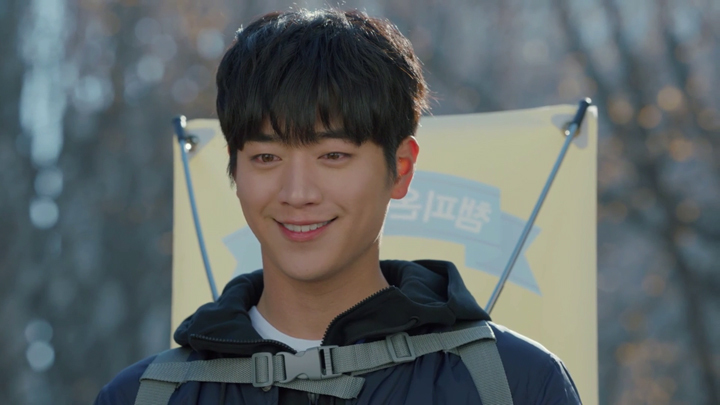 Kang So Bong falling for an AI robot was something we didn’t know could be possible. But Are You Human Too? does bring Kang So Bong to like Nam Sin III. She confesses at the time when she was worried about Nam Sin III disappearing. 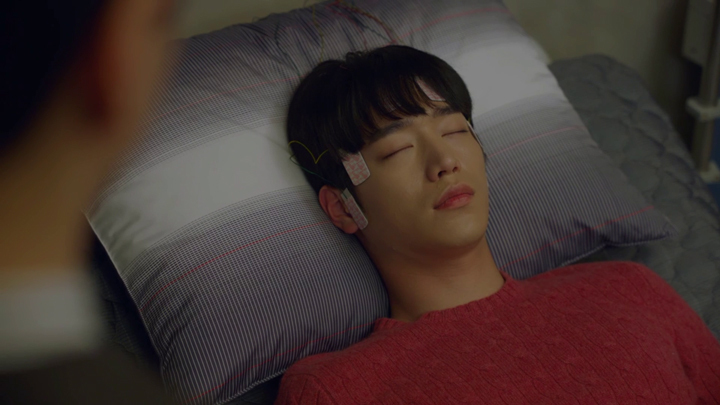 The worry comes at a time when Nam Sin’s mother has hidden the kill switch to Nam Sin III and shows to have the intention of activating it when the real Nam Sin wakes up. We’re told that Nam Sin’s mother had installed this kill switch into Nam Sin III just before he was sent here on this task to pretend to be Nam Sin (Episode 21 & 22). This kill switch which activates the one inside Nam Sin’s body is said to be like death to humans. We hear more of what the kill switch does to Nam Sin III when Kang So Bong goes to Nam Sin’s mother to try negotiating a handover of the kill switch to her. Kang So Bong tried with threatening to stick by Nam Sin III’s side day and night so that once Nam Sin’s mother activated the kill switch, she would become a murderer (Episode 23 & 24). The kill switch is something that not only shuts Nam Sin III down, it also brings Nam Sin III to self-destruct and cause an explosion. The kill switch, however, has no effect if Nam Sin III isn’t powered at the time the kill switch is activated. Nam Sin III is safe from being destroyed by the kill switch if he is in a ‘dead state’. With Kang So Bong’s confession, she unknowingly confesses to the real Nam Sin :o/ :o/. She does later reveal her feelings to the right Nam Sin, though. 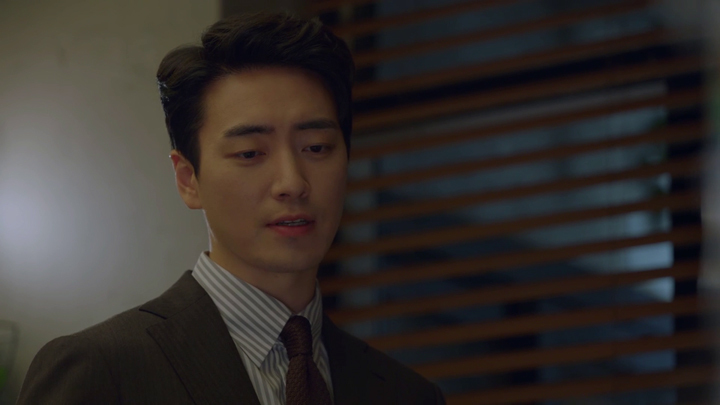 Nam Sin III doesn’t show much of a reaction to when Kang So Bong tells him she likes him more than she already does and it’s a like that a person has for a human man. Nam Sin III doesn’t know the feeling of like or love. However, Nam Sin III attempts to feel the like that Kang So Bong feels: he hugs her. Unfortunately, he doesn’t feel it and apologises. This doesn’t make Kang So Bong sad. She hadn’t expected anything from him. Kang So Bong goes to give Nam Sin III her mother’s necklace to wear. 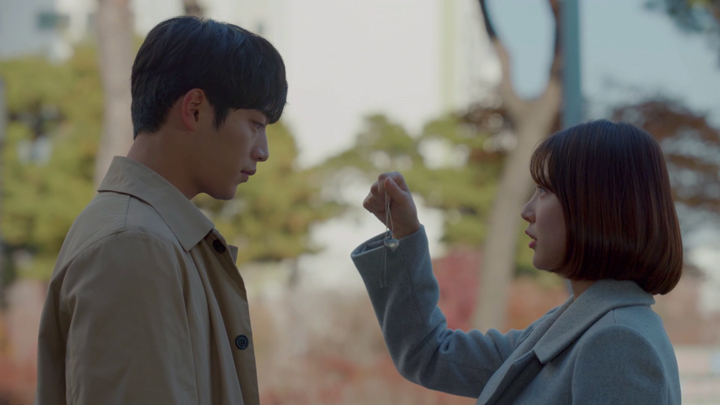 When Nam Sin III wonders why she was giving him her mother’s necklace, Kang So Bong explains: “My mum said that this pendant is my mum’s love for me. So, I should give it to someone whom I want to give my heart to later on. 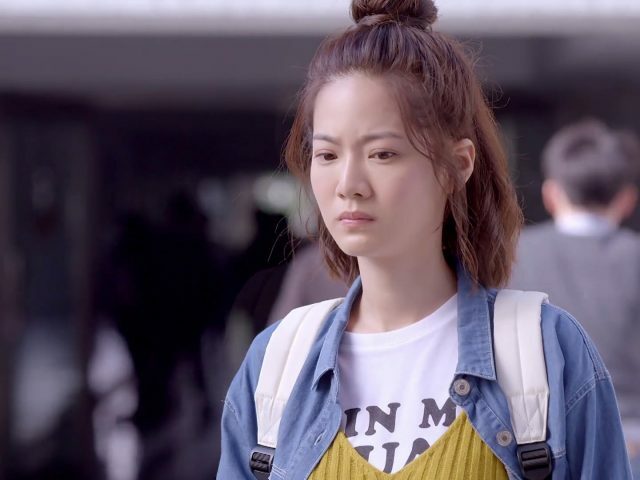 She said I must know how to give all I have without thinking about what I’ve received to become a real adult (Episode 23 & 24).” This seems to see Kang So Bong telling Nam Sin III he is someone she unconditionally loves—which is something she had said when she first confessed her feelings to the other Nam Sin. That is, the real Nam Sin! 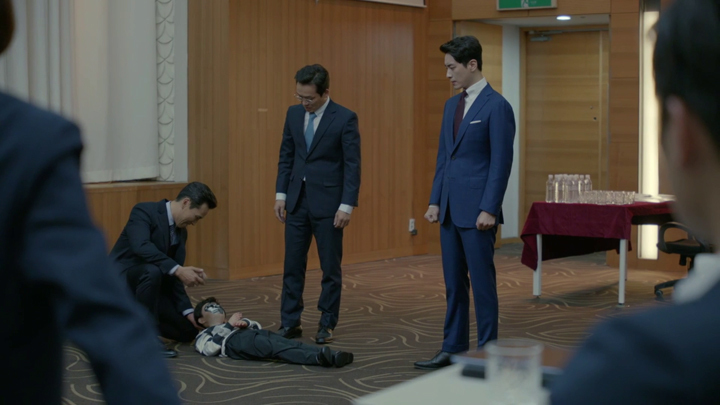 When we finally see the real Nam Sin wake up, he’s well enough to make Seo Jong Gil look ridiculous in his move of revealing the fact that the Nam Sin they’ve been interacting with is a robot during a small meeting at the company which included the chairman and the three staff members we’ve seen working under Nam Sin III (Episode 23 & 24). Seo Jong Gil provided evidence of Nam Sin being a robot with showing everyone the child AI robot Nam Sin, Nam Sin I. Doing this, however, Seo Jong Gil had fallen victim to Nam Sin’s plan which seemed to have been in motion for some time. Through Seo Ye Na’s retelling of events, we’re told Nam Sin had actually come out of his coma longer than we have been shown. The only person who knew about Nam Sin being awake was herself. It’s because Nam Sin didn’t trust anyone but her. 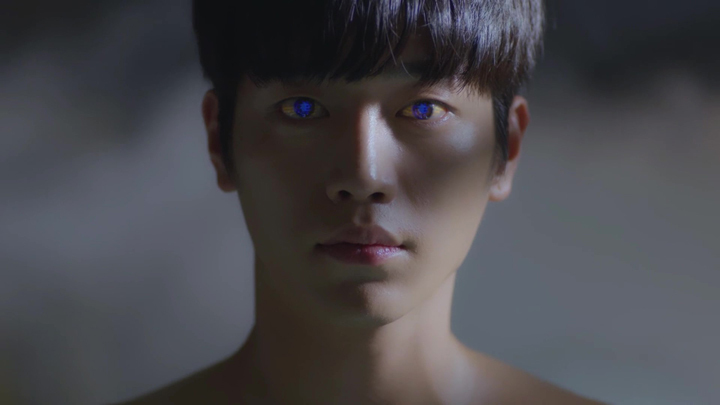 Nam Sin had allowed Seo Jong Gil the ability to track him and find the evidence to prove his belief Nam Sin was an AI robot. 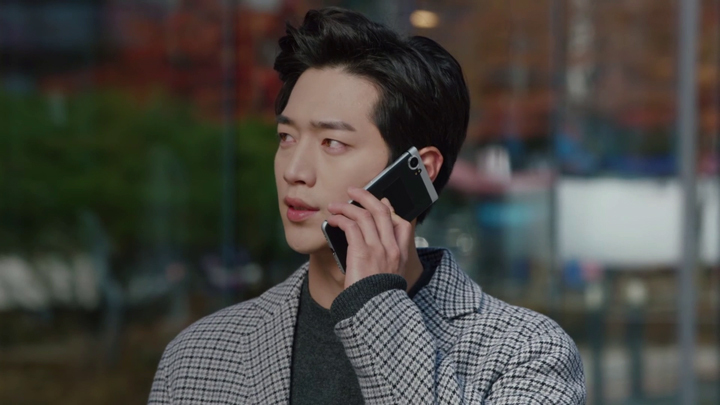 He instructed Seo Ye Na to turn on her phone which had been powered off for a while. This allowed Seo Jong Gil to track Seo Ye Na’s location and in turn Nam Sin’s location. He got Seo Ye Na to help give Seo Jong Gil the evidence as well. Nam Sin then had Seo Ye Na make sure Nam Sin III was not at the company so he could attend the meeting Nam Sin III was supposed to attend. Seo Ye Na asked Nam Sin III to go to the house to protect Nam Sin because her father has found out the location. 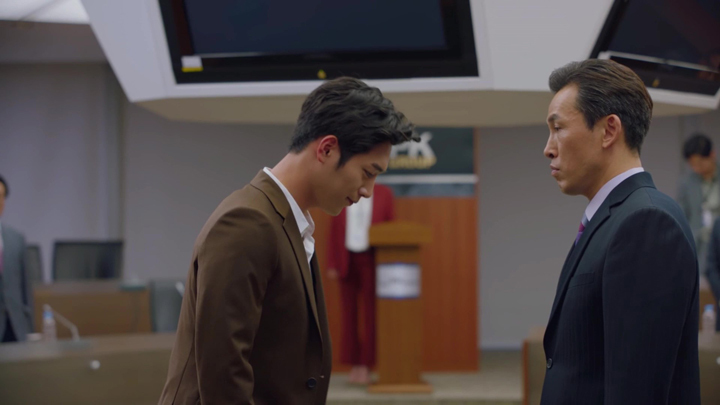 With Nam Sin III out of the way, Nam Sin headed to the company and sat in the meeting where Seo Jong Gil comes into the room and utters his belief that Nam Sin was a robot. Nam Sin surprises Seo Jong Gil and everyone in the room that he was indeed human and not a robot with breaking a glass cup and bleeding from the pieces of glass. Nam Sin is very different from the Nam Sin that Nam Sin III has been performing in front of everyone. Nam Sin III has shown some care and levelheadedness in amongst the cold and harsh attitude he expresses when being Nam Sin. Nam Sin, however, has none of the care or levelheadedness. We see Nam Sin being angry with the situation when he wakes up. This seems to push him constantly towards being someone who gets aggravated at every word and action of those around him, making him hard to reason with. He doesn’t seem to ever listen or see much more than he is willing to see or listen to, either. Nam Sin’s anger seem to come from feeling hurt with the belief that his mother has chosen to replace him with a robot clone. While he has been looking for his mother for some time, his mother seems to have chosen to abandon him and gone to create a robot clone of him (Episode 27 & 28). Nam Sin to Nam Sin’s mother – Who is your son? This seems to show Nam Sin continuing to dislike the thought that a robot can be mistaken as the real thing. He heard his mother say this to be a possibility for robot technology during a lecture of hers that he sat in 20 years ago. Nam Sin had expressed dislike towards the possibility of robots becoming very human-like then as well. When he saw a slide go to an image of a robot and an image of him—a slide that demonstrated his mother’s belief that robot technology could become advanced enough for a very human-like robot to exist—Nam Sin exclaimed he wasn’t a robot but a person. Nam Sin’s mother halted her lecture at this point to answer Nam Sin. Yes, he is indeed a person. The following thing Nam Sin’s mother said would be something Nam Sin wouldn’t want to hear from his mother if she said it now: in a joking manner, speaking to her class, Nam Sin’s mother said that sometimes she wished her son was an obedient robot. Her next words which she directed to Nam Sin would also be something annoying to hear to the present Nam Sin: Nam Sin’s mother told Nam Sin that if he didn’t behave, she might go make a robot that looked just like him and favour it more (Episode 1 & 2). Nam Sin seems to be feeling this is what’s happening now after waking up from his coma. He goes to look for how much consideration his mother gives to his AI robot clone, Nam Sin III. Nam Sin has Nam Sin III help him with this. He guides Nam Sin III on the questions to ask his mother. Can he continue to stay even if the human Nam Sin fully recovers? Is the human Nam Sin the only one she cares about? With the first question, Nam Sin’s mother says she doesn’t want to talk about it. With the second question, she hesitates to answer it. Nam Sin does find out his mother’s thoughts on Nam Sin III when she becomes frustrated and comes out with words with an intention to be hurtful. She says she regrets making him. She won’t go with him. She wants him to leave and never come back. If he does comes back, she will die. These words his mother had said to Nam Sin III, Nam Sin recognises them to be those that he, himself, have said before. They were said to his mother by force as means to ensure her safety. Care for Nam Sin III was how Nam Sin read the outburst his mother directed at Nam Sin III (Episode 23 & 24). Nam Sin to Ji Young Hoon – Do you know me? 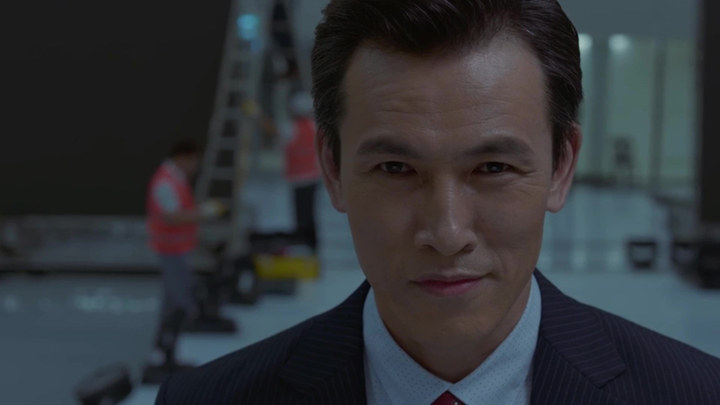 Ji Young Hoon has Nam Sin’s better side, but he still receives Nam Sin’s want to understand where he stood with him, how much consideration he gives to Nam Sin III and whether he gets confused between him and his AI robot clone. Ji Young Hoon has been showing care towards Nam Sin III. When Ji Young Hoon learnt about a kill switch existing in Nam Sin III’s body, he wasn’t indifferent to the information. 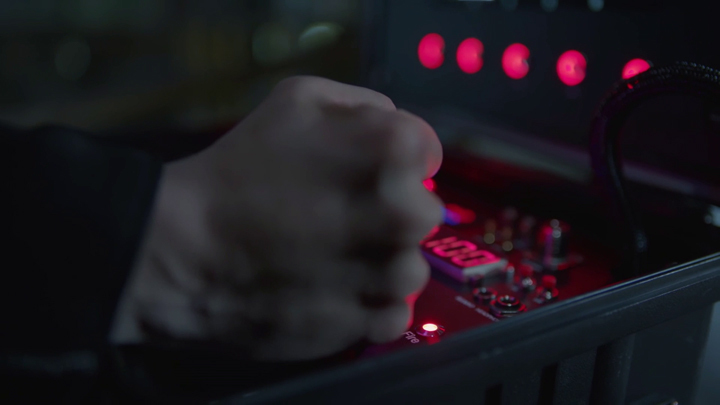 He thought Nam Sin III would be shocked if he found out about this kill switch that was inside him (Episode 9 & 10). It’s a reaction that indicates to us that Ji Young Hoon is someone who sees Nam Sin III as not a robot, but a person. He feels troubled towards this fact of Nam Sin III having a kill switch. Ji Young Hoon goes to apologise to Nam Sin III for making him come to Korea and act as Nam Sin when Nam Sin III shows Ji Young Hoon his dedication towards helping them all out with this task that may end up with him being destroyed (Episode 11 & 12). Ji Young Hoon had tried to deny he was someone who saw Nam Sin III as a person. He expressed this to Nam Sin III during a casual talk he had with Nam Sin III one evening by the pool. This talk also had Ji Young Hoon express how he at times wished Nam Sin was more like Nam Sin III who did things rationally and got things done. 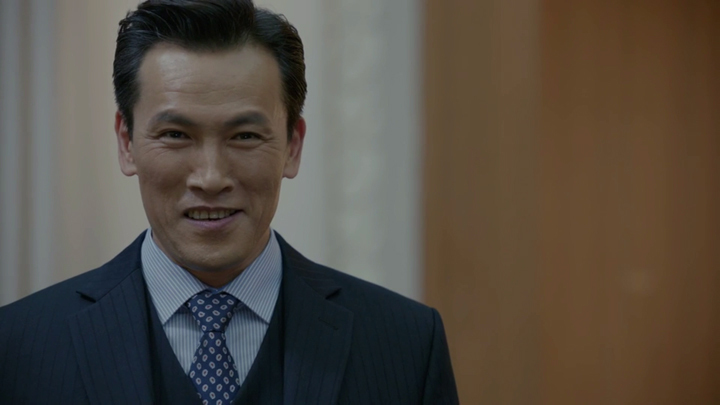 We hear the trust Ji Young Hoon has in Nam Sin III’s ability to make good judgments and decisions. He expresses to Nam Sin III that he has his full support: so long as it was good for Nam Sin, he was okay for Nam Sin III to continue making his own decisions (Episode 19 & 20). Nam Sin shows he is aware of the consideration Ji Young Hoon gives to Nam Sin III, but not to the extent of knowing that he sees him as a person and wants Nam Sin to have some of the qualities that Nam Sin III has. These are the things that Nam Sin no doubt seeks to find out. 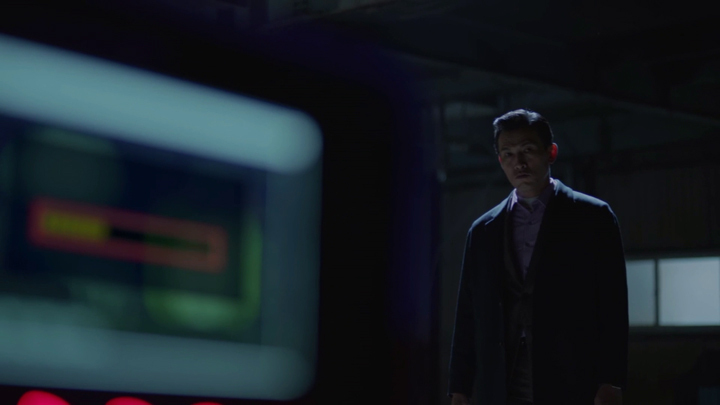 The first opportunity to gather Ji Young Hoon’s thoughts on Nam Sin III comes when he asks Ji Young Hoon if he is able to help him bring Nam Sin III to him so he could see what his AI robot clone looked like. Ji Young Hoon rejects it. There is no need for Nam Sin to see Nam Sin III when they will send him away once he’s better. Nam Sin isn’t pleased Ji Young Hoon is denying him of this desire to see Nam Sin III. He asks why he can’t see his AI robot clone. “You may feel weird,” Ji Young Hoon says. Nam Sin wonders if it’s Ji Young Hoon who has been feeling weird. Ji Young Hoon provides no response to this. He also makes no arrangements to bring Nam Sin III to him. Nam Sin could only get Nam Sin III over to him by way of Kang So Bong (Episode 23 & 24). With Nam Sin seeing Ji Young Hoon as someone who knows him best, he goes to ask Ji Young Hoon if he was ever confused.”Of course not,” Ji Young Hoon’s responds. Nam Sin shows he felt it to be otherwise. Nam Sin reveals to us that he had been awake on one occasion where he was supposedly still in a coma. Ji Young Hoon’s response to Nam Sin’s question about whether he was ever confused brings Nam Sin to recall a past moment where Ji Young Hoon spoke his thoughts aloud as he looked onto Nam Sin who lay in a coma. We see Nam Sin recalling Ji Young Hoon say he pitied Nam Sin III because he recognised that he was being harassed by people just like Nam Sin. Ji Young Hoon had spoken a bit more in this moment in the past, but we’re unsure if Nam Sin had also heard them. Ji Young Hoon had also said that Nam Sin III reminded him of Nam Sin and Nam Sin in turn reminded him of Nam Sin III. He had wished for Nam Sin to wake up already because he was becoming confused with his feelings (Episode 17 & 18). Ji Young Hoon is tested on his ability to recognise the real from the fake Nam Sin. Nam Sin heads into a meeting with his grandfather where Nam Sin III was supposed to be present. This meeting is one seeing Nam Sin’s grandfather discuss about handing over the company to Nam Sin. The Nam Sin that Nam Sin’s grandfather had in mind of handing his company over to is not the human Nam Sin, but the AI robot Nam Sin, Nam Sin III (Episode 25 & 26)! Nam Sin’s grandfather is a character revealed to have known all along that Nam Sin had been performed by an AI robot. We get informed of this with a scene showing David (Choi Deok Moon)—a scientist who is a father-like figure to Nam Sin III—speaking with Nam Sin’s grandfather at a data centre located inside PK Group’s building housing a room full of servers storing Nam Sin III’s brain. The funds that allowed Nam Sin’s mother to create Nam Sin III came from David going to Nam Sin’s grandfather for it (Episode 19 & 20). In this meeting that Nam Sin attends instead of Nam Sin III, Nam Sin’s grandfather is the quicker one to realise that the Nam Sin he has been talking to wasn’t Nam Sin III but the real Nam Sin. He realises this with finding no wristband on his left wrist when Nam Sin had pulled his seat out when he went to seat himself. Ji Young Hoon, however, doesn’t realise that the Nam Sin he was with was the real Nam Sin and not Nam Sin III until Nam Sin took a drink and Nam Sin revealed himself when Ji Young Hoon found it odd that Nam Sin was drinking. (Nam Sin III seems to be able to eat, but not drink.) Ji Young Hoon was not impressed by this trick Nam Sin pulled on him. This resulted in Ji Young Hoon being frustrated by Nam Sin persistently difficult behaviour and attitude towards him and the situation. He speaks hurtful words that he regrets saying. Ji Young Hoon tells Nam Sin to get a hold of himself so that he doesn’t come to be someone who is worse than a robot. (Episode 25 & 26). Nam Sin to Kang So Bong – Are you confused? Nam Sin no doubt knows Kang So Bong likes his AI robot clone since he personally heard the confession of hers that was meant for Nam Sin III but was made to him. However, we see Nam Sin also goes to Kang So Bong to hear her thoughts. He has scepticism that her like is for a robot. This takes place when Kang So Bong goes to him wanting to know what he has gotten Nam Sin III to do after Nam Sin III disappeared from her side during a trip out to buy her dad some medicine—medicine that was for fainting from shock of learning that the Nam Sin her dad has been interacting with was an AI robot. Kang So Bong lost sight of Nam Sin III after a kiss on the forehead that followed from two other affectionate gestures from Nam Sin III. The affectionate gestures from Nam Sin III were Nam Sin III’s way of trying to make up for giving checking out girls a go and this had made Kang So Bong unhappy. 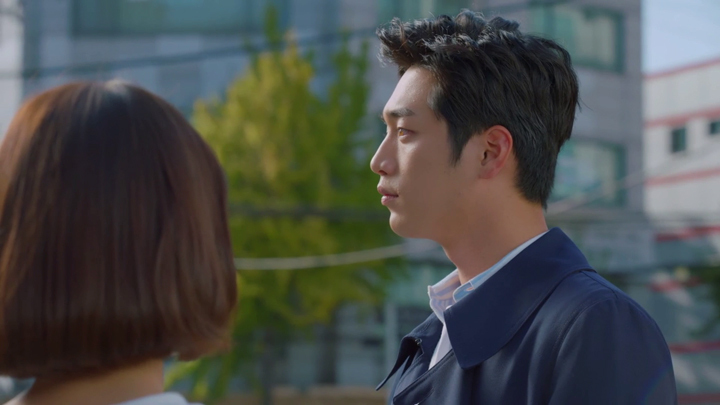 The kiss on the forehead made Kang So Bong absentminded. She only realised Nam Sin III had gone to help Nam Sin with a task when she read the message he sent to her after she made it back home by herself (Episode 23 & 24). Nam Sin doesn’t worry himself with informing Kang So Bong that what he got Nam Sin III to do was getting him to help him test if his mother cares about Nam Sin III. He responds with being surprised to find that there wasn’t communication between her and Nam Sin III. Kang So Bong becomes confused when Nam Sin speaks of the like she has towards Nam Sin III. “I thought you like him. You confessed to me, remember?” Kang So Bong is confused by what her like towards Nam Sin III had to do with him. Nam Sin responds with recognising that Kang So Bong had fallen for Nam Sin III on the job of guarding him. He wishes for her to protect him as well. This response from Nam Sin sounds very much like interest coming from Nam Sin to Kang So Bong. But, we see it’s Nam Sin being unconvinced a human can like a robot. This is the explanation Nam Sin gave to Seo Ye Na when she asked him what he had meant by ‘protect him as well’ and ‘hate him because he’s human’. This meeting between Nam Sin and Kang So Bong ends with Nam Sin aggravated. 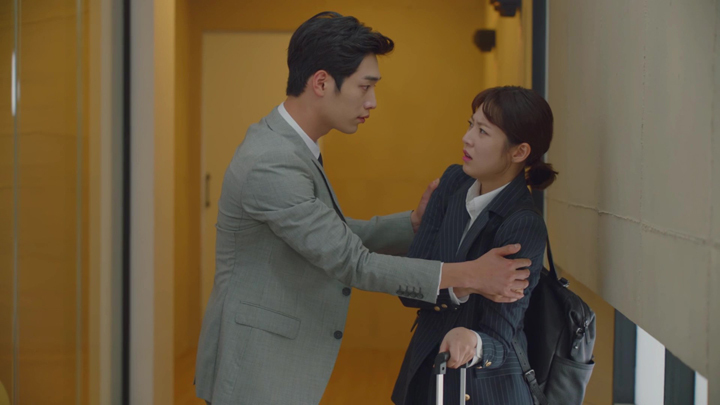 He shows fury in his eyes and extends a forceful grip at Kang So Bong’s arm after he hears her response to his question asking if her hate towards him had to do with the fact that he’s human. It isn’t. It’s that he isn’t human at all. Kang So Bong is someone Nam Sin tests to see whether she is able to differentiate between him and his AI robot clone. 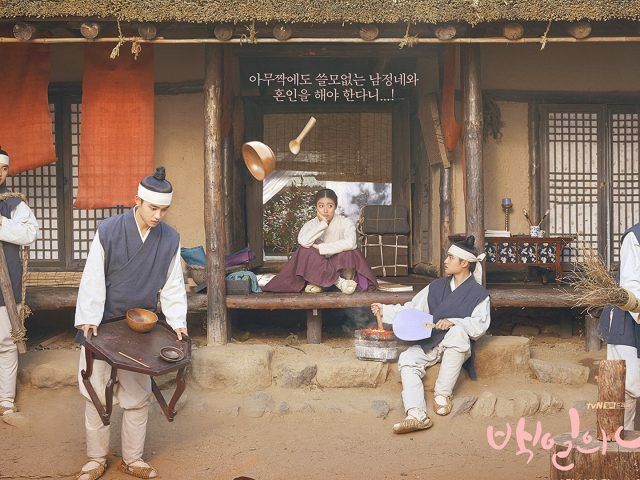 He finds an opportunity when he catches sight of her on the streets after the meeting he had with his grandfather and Ji Young Hoon where he found Ji Young Hoon couldn’t differentiate between him and Nam Sin III (Episode 25 & 26). Nam Sin gets as far as following Kang So Bong to the café where she sits waiting for Nam Sin III and breaking out Nam Sin III’s friendly expression ready to meet Kang So Bong before Nam Sin III appears and stops Nam Sin from achieving his desire to have some fun with Kang So Bong. Nam Sin III shows he’s not impressed with Nam Sin’s behaviour. He instructs Nam Sin to not approach Kang So Bong like this again. Unlike his mother and his grandfather, Kang So Bong isn’t someone he came to be acquainted with through being Nam Sin. 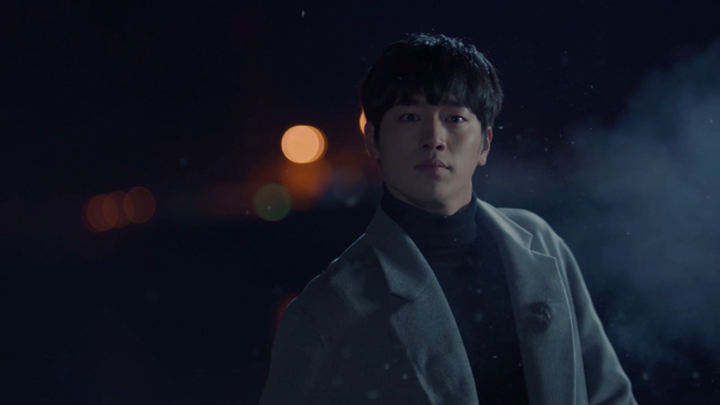 Kang So Bong is his person and his alone. Nam Sin may succeed in having fun with others in his trick of substituting Nam Sin III with himself in meetings Nam Sin III has with his people. Kang So Bong, however, shows Nam Sin it isn’t so easy to have fun with her with pulling this trick of his on her. Nam Sin finds this out during a talk he has with Nam Sin III at home. This talk between Nam Sin and Nam Sin III sees Nam Sin having an aim to make Nam Sin III lose his cool. Nam Sin says Kang So Bong is currently at the home and is in his room. 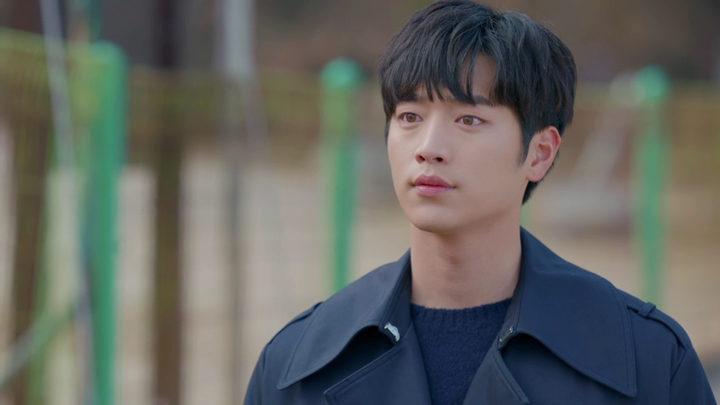 He says people should be with people before he wonders if he should pretend to be him and hold hands and kiss Kang So Bong. This causes Nam Sin III to show what looks like anger (Episode 27 & 28). Kang So Bong shows that the fun Nam Sin believes he’d be able to have with her by pretending to be Nam Sin III isn’t so easy when Kang So Bong knows who is Nam Sin III just by looking. She demonstrates this when she looks and speaks to the Nam Sin in the navy-blue outfit. That’s Nam Sin III. 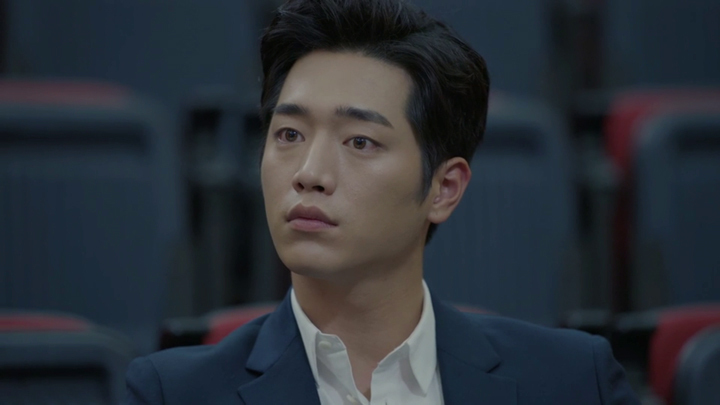 Nam Sin is impressed by Kang So Bong’s ability to differentiate him and Nam Sin III with just a look. Later in the evening, by the pool, as he recognised Kang So Bong to be thinking about Nam Sin III, Nam Sin asks Kang So Bong why is it that she doesn’t get confused when everyone else gets confused. She says she just knows when she sees him. Nam Sin concludes this ability she says she has of recognising who was Nam Sin III to be the power of love. There is an occasion where Nam Sin does manage to have Kang So Bong not notice she was with him and not Nam Sin III. This takes place on a day out that Nam Sin III and Kang So Bong has around town which ends with a night at the movies. Nam Sin III provided Nam Sin an opportunity for a switch to take place when he comes out of the movie theatre to grab some tissues for the tears that Kang So Bong had as she watched the movie. 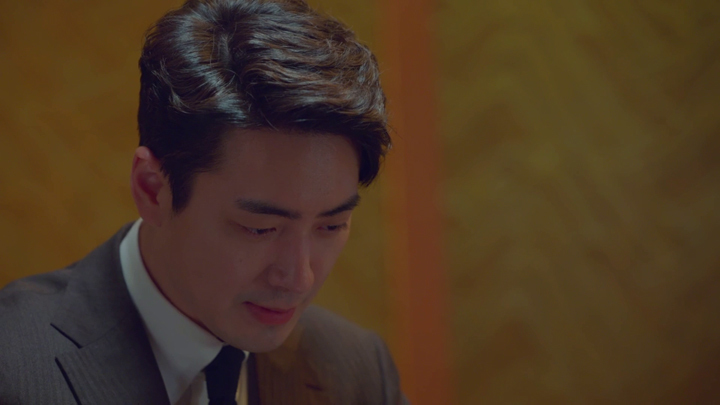 Nam Sin uses Ji Young Hoon as means to allow the switch to take place. We see Nam Sin head into the movie. 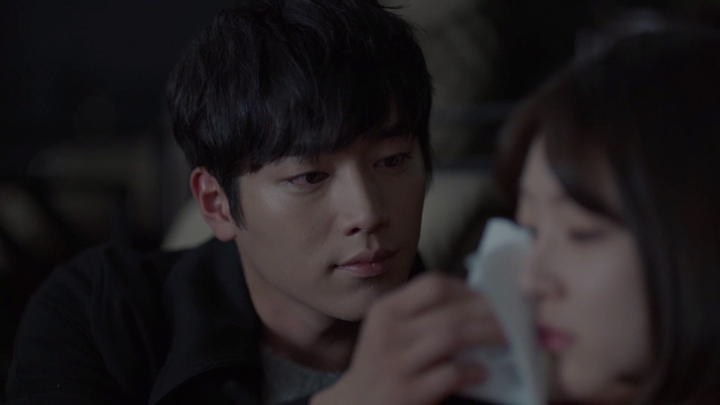 He helps Kang So Bong wipe her tears away. 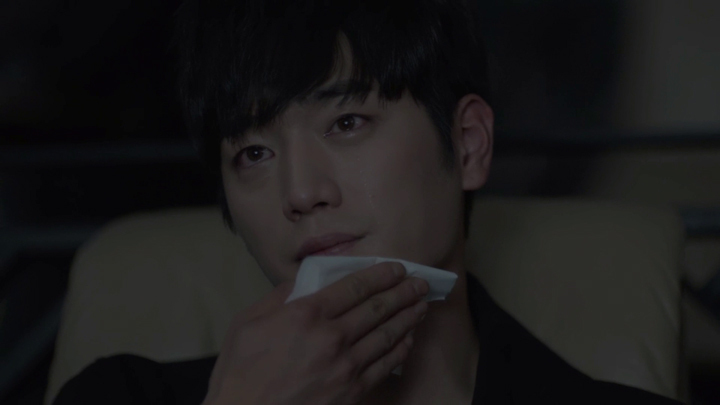 He smirks when Kang So Bong shows shock upon seeing his tears streaming down his face. Tears looks to be something not possible for a robot. Nam Sin had just managed to fool Kang So Bong (Episode 29 & 30). The way Nam Sin handles his dissatisfaction with being replaced by an AI robot has been harmless fun. But, Nam Sin plays a lot more recklessly after he learns that his grandfather had known all along about Nam Sin III. It brings Nam Sin to ask for the ability to take control of Nam Sin III to show his grandfather the real from the fake. A wristband watch with manual mode is placed onto Nam Sin III with a command that no one is allowed to touch the wristband watch not even Nam Sin III can touch it. What this means is we see Nam Sin III go against the rule of protecting people. Nam Sin makes Nam Sin III violent on two occasions. The first occasion where we see Nam Sin III controlled by Nam Sin is in the elevator with Kang So Bong. Nam Sin III is made to strangle Kang So Bong after Nam Sin hears their brief talk about a meeting Nam Sin III had with his grandfather where they talked about a dream he wants to realise for the company. The violence that Nam Sin III was made to act on Kang So Bong concerned Nam Sin III. It concerned him to the point of preferring to end his existence with jumping down from the rooftop of a high rise building than continue to allow Nam Sin to control him in such a way. Even such a move as voluntarily making himself disappear to appease Nam Sin’s hatred of him, Nam Sin doesn’t allow. Nam Sin brings Nam Sin III to turn around and step away from the edge with activating manual mode. After Nam Sin indicates to Nam Sin III that choosing when to disappear is also out of his control and in his control, Nam Sin III says something that later strikes a cord with Nam Sin. Nam Sin III responds with seeing helplessness is probably the human emotion that he’d be feeling at this moment. We feel Nam Sin is able to relate to Nam Sin III’s feeling of helplessness with experiencing the feeling of helplessness himself when his grandfather forced him to make his mother leave him in order to guarantee her safety when he was seven years old. Some time later, in his room and as he absentmindedly played with a robot figurine in his hand, we see Nam Sin stop and think about his hatred towards Nam Sin III in this moment as he recalls Nam Sin III’s words of indicating how powerless he is when he is nothing but a machine. 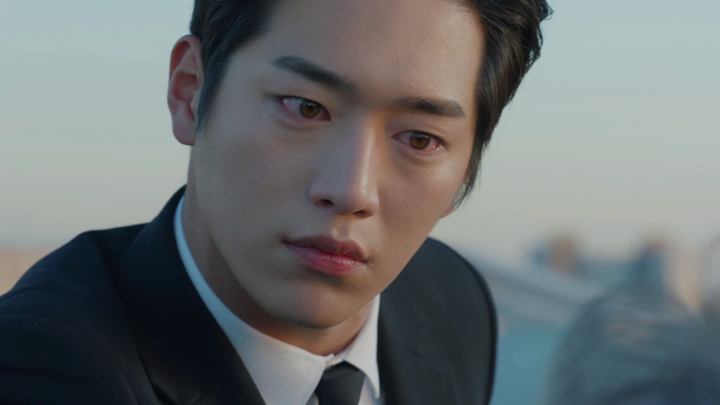 This moment of Nam Sin showing a bit of reflection on his actions and behaviour doesn’t last more than a moment when he resumes his anger towards Nam Sin III and the situation after Ji Yoon Hoon goes to him, asking him to stop the manual mode because he knows it wasn’t an error in his programming as he had told his mother of whom believed him (Episode 29 & 30). The next occasion occurs with intent to kill. 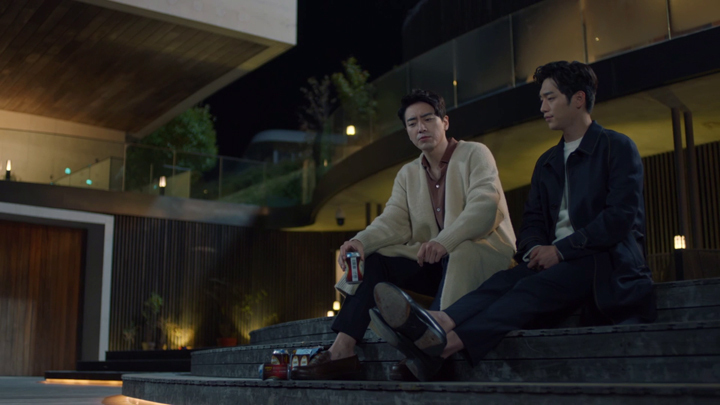 It comes after a meeting Nam Sin has with Seo Jong Gil where Nam Sin gains more information about his father’s suicide that occurred around the period he was forced to separate from his mother. Seo Jong Gil had told Nam Sin that his belief that he killed his father may not be wrong when he followed the orders of his grandfather. He had kept a watch of his father of whom was confined in a room in a nursing home even when he wasn’t sick. Seo Jong Gil goes on to tell Nam Sin that his father fell whilst he tried to escape to see him and his mother. Disguising the accident as suicide was also his grandfather’s orders. 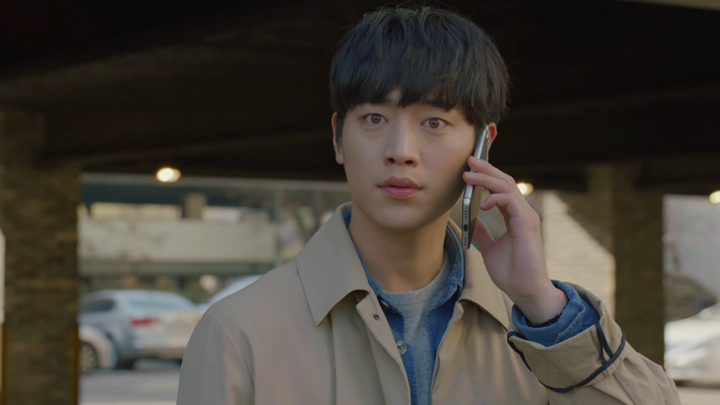 Explaining why the accident to be disguised as suicide Seo Jong Gil allows Nam Sin to make sense of it from a recording of his father and grandfather at the nursing home. Before Seo Jong Gil lets Nam Sin listen to the recording, he gives Nam Sin a warning to be careful of his grandfather. His grandfather will get rid of him without hesitation at the moment he finds Nam Sin III to be more beneficial to him just as he had done so with him and his father. It had been a competition of survival between Seo Jong Gil and Nam Sin’s father of saw him winning and his father losing, Seo Jong Gil says. This recording that Nam Sin comes to listen to has Nam Sin’s father wishing to reveal some information that Nam Sin’s grandfather wishes to stay hidden. Nam Sin’s grandfather makes a mention of Nam Sin’s father being a loser that lost to Seo Jong Gil before Nam Sin’s grandfather threatened Nam Sin’s father to comply with his wants with bringing Nam Sin into their fight because Nam Sin’s grandfather saw his company as more important than blood. Though the information Seo Jong Gil gave on the events that led up to Nam Sin’s fall were not lies, the recording that framed up a view of Nam Sin’s grandfather as a terrible man who cared more about his company over his own flesh and blood fell short of revealing the actual cause of Nam Sin’s father’s death. The story given on Nam Sin’s father is that he was put into a nursing home when he wasn’t sick. He was confined there because he found that Nam Sin’s grandfather had killed someone and he had documents that he wanted to use to reveal his grandfather’s misdeeds. 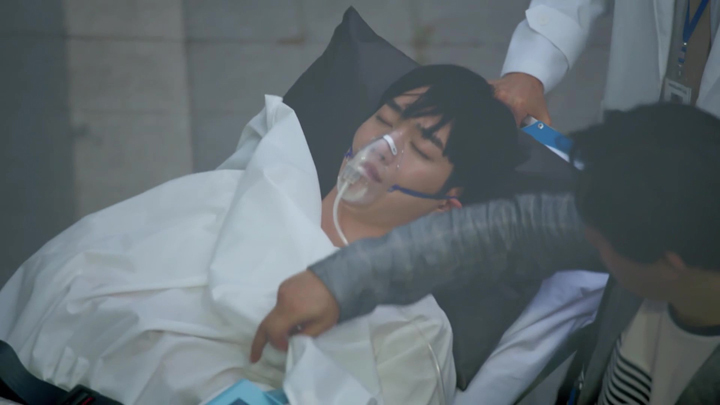 Nam Sin’s father had indeed fallen when he was trying to escape to see Nam Sin and his mother after Seo Jong Gil didn’t agree to let him out. Seo Jong Gil was Nam Sin’s father’s secretary who wished to follow his grandfather’s orders. It was necessary for Seo Jong Gil to do to keep working in the company because unlike Nam Sin’s father who was related by blood, he was just an orphan the chairman took in. He would have nothing if he went against orders. Seo Jong Gil was there when Nam Sin’s father fell from an upper level to the ground as he tried to escape. 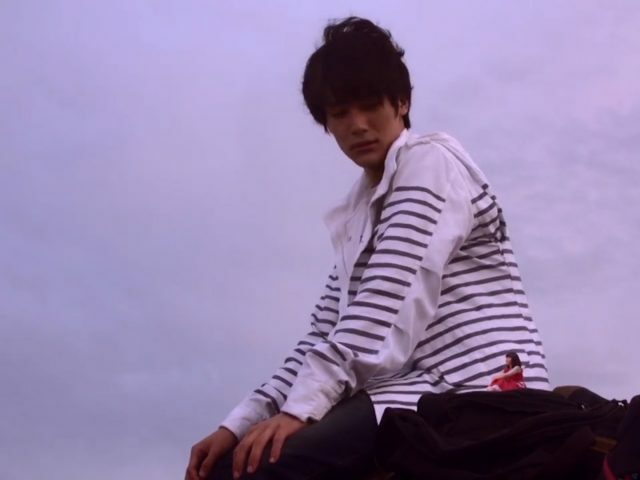 Seo Jong Gil had initially thought to call an ambulance when he saw Nam Sin’s father lying on the ground injured. However, he chose to turn a blind eye to helping Nam Sin’s father. He chose to end him with strangling him. How Nam Sin’s grandfather came to deciding to disguise Nam Sin’s father’s death as suicide was Seo Jong Gil using his knowledge he had of Nam Sin’s grandfather’s reason for locking up Nam Sin’s father. This was of course Nam Sin’s father wishing to reveal his grandfather’s misdeed of killing someone (Episode 31 & 32). Seo Jong Gil framing up a view of Nam Sin’s grandfather as a despicable man who can get rid of even his own flesh and blood, Nam Sin brings Nam Sin III to strangle his grandfather. Nam Sin III does not release his grandfather from the strangling until Kang So Bong intervenes. She calls out to Nam Sin III to try to get him out of his state. Kang So Bong’s attempt to stop Nam Sin III from strangling Nam Sin’s grandfather only brings Nam Sin III attention to her. Kang So Bong is afraid initially. She crawls backwards as Nam Sin III comes for her. She decides to stand firm and allow Nam Sin III to come at her. As Nam Sin III strangles her, Kang So Bong begs Nam Sin III to break out of manual control. 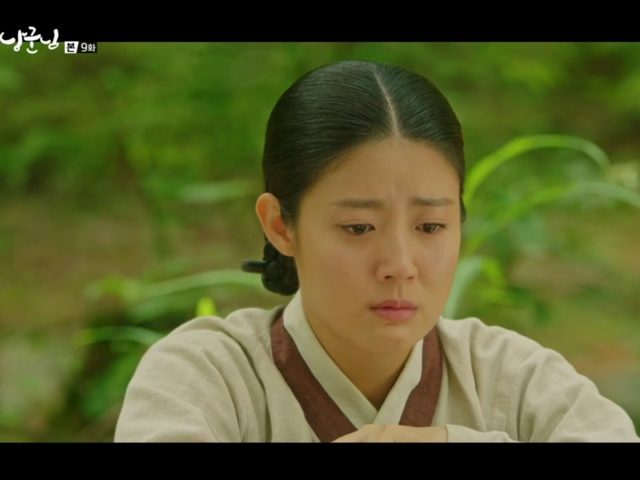 Kang So Bong’s wish for Nam Sin III to break out of manual mode comes when her tears touch the skin of the hand Nam Sin III uses to strangle her. It brings him to follow his #1 rule of hugging people when they cry and block Nam Sin access to manual mode on Nam Sin III. Nam Sin III stops strangling Kang So Bong and hugs her (Episode 31 & 32). Failing to control Nam Sin III, Nam Sin focuses on not allowing his grandfather to succeed in making Nam Sin III the owner of PK Group. He joins forces with Seo Jong Gil. With Nam Sin’s grandfather falling ill with dementia, Nam Sin manages to get the transferring of his grandfather’s stocks to the company to himself. A shareholders meeting is held. 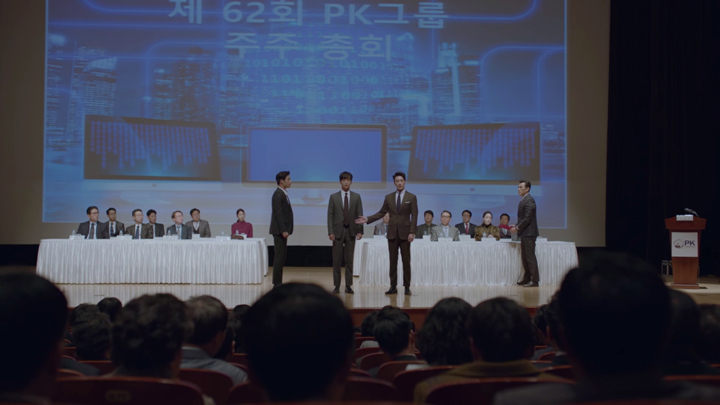 Seo Jong Gil makes an announcement of a leadership change from the current chairman, Nam Sin’s grandfather, to Nam Sin. Nam Sin’s achievements are listed by Seo Jong Gil before Nam Sin is asked to take the stage and be introduced as the new chairman of PK Group. Ji Young Hoon, however, stops this as he informs that it’s not the Nam Sin who is about to take the stage that has made those achievements Seo Jong Gil listed. Rather, another Nam Sin was and is the brains behind PK Motor’s past, current and future projects. He is an AI robot. Ji Young Hoon announces that he’s to lead PK Group with the AI robot Nam Sin as the one to run the company (Episode 31 & 32). Preparations had been made by Ji Young Hoon prior to the shareholders meeting to bring about this quick change in leadership of PK Group from Nam Sin to Ji Young Hoon. A rewriting of transferral of stocks contract signing took place with Nam Sin’s grandfather the previous day. 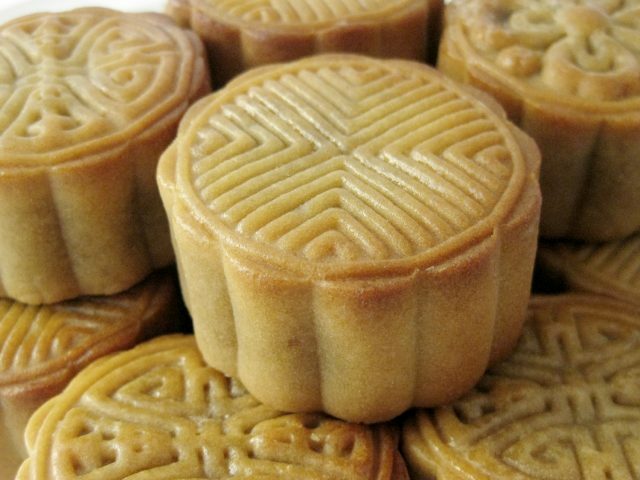 Nam Sin’s sister, Nam Ho Yeon (Kim Hye Eun), threw in her stocks as well as a bonus. She is someone who comes to support Ji Young Hoon and Nam Sin III after Nam Sin III revealed his secret of being an AI robot to her. The support seems to come from Nam Sin III proving himself to be someone worth trusting with the many occasions where he showed kindness and care towards her young son who lived with a heart condition. After a moment seeing complaint coming from a shareholder who felt it was nonsense that an AI robot was going to manage the company, Nam Sin III was allowed to speak of his vision of a new project that he describes AI robots coexisting with humans. It’s where AI robots don’t dominate humans. They simply make up for what humans lack. Nam Sin III becomes accepted as the new person managing the company. Nam Sin III is also accepted by the general public following from news releases made by Reporter Jo reporting the heroic acts of Nam Sin III in the PK Motors fire and PK Motor’s self-driving car event. Nam Sin III is seen as something of a technology advancement in the field of artificial intelligence. Nam Sin isn’t out of moves after this failure to prevent his grandfather from giving PK Group to Nam Sin III. There’s the kill switch of which can destroy Nam Sin III. Nam Sin manages to learn about it by accident during a visit he makes to his grandfather. 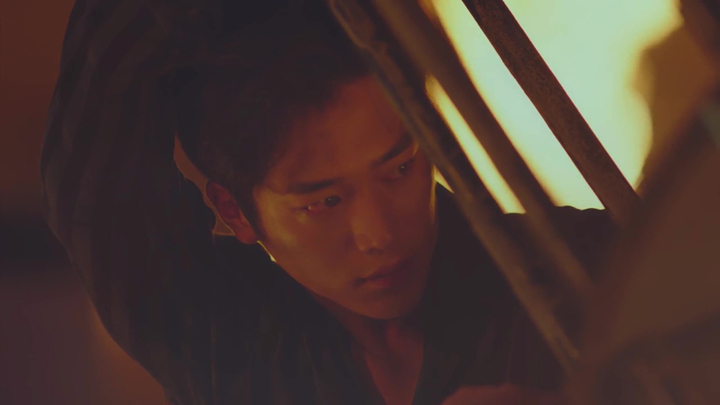 Nam Sin is there wanting to know why his grandfather had given the stocks to Ji Young Hoon and unhappy he was taking away everything and everyone away from him. Nam Sin’s grandfather having dementia, he isn’t able to recognise that the Nam Sin talking to him is Nam Sin not Nam Sin III. As Nam Sin’s grandfather tells Nam Sin that he doesn’t need to continue with pretending to be Nam Sin and tells him he needs to be careful of Nam Sin as Nam Sin will come kill him one day, he lets out the information about the kill switch being something that can make him disappear (Episode 33 & 34). Nam Sin’s grandfather informs there is a kill switch but doesn’t say where the kill switch is located at. The kill switch had originally been stored inside the server room that held all the data of Nam Sin III’s brain at PK Group. However, since then, the kill switch is elsewhere. Nam Sin recalls the encounter he had with David of that moment David took the kill switch and moved it elsewhere. This elsewhere comes to be at Kang So Bong’s martial arts gym. With only the obstacle of encountering the workers of the martial arts gym where it required Nam Sin to quickly switch to Nam Sin III’s persona for a bit, Nam Sin manages to take possession of the kill switch without much trouble. In possession of the kill switch, Nam Sin goes to Nam Sin III. Nam Sin III is outside a café where Kang So Bong, Kang So Bong’s dad, Reporter Jo and the workers at the martial arts gym hold a surprise party to celebrate the day Nam Sin III was created. This party is a surprise birthday party for Nam Sin III. Nam Sin shows Nam Sin III he is in possession of the kill switch. He informs Nam Sin III he has the intention of activating it today. Nam Sin allows Nam Sin III a bit of time to wrap things up with the people he needs to wrap things up with. Nam Sin III tries contacting his mum, but there is no answer. Nam Sin III doesn’t return back into the café to his surprise birthday party. He does, however, leave the necklace he had bought for Kang So Bong hanging on an indoor plant in the café. We’re not sure if Nam Sin III had intended for Kang So Bong to find this necklace or not with hanging the necklace on the indoor plant in the café, but Kang So Bong does find it. She comes out with it just as Nam Sin III is about to get into a taxi to meet up with Nam Sin. Kang So Bong doesn’t come to find anything odd about Nam Sin III leaving their gathering. It never crosses her mind that Nam Sin III is leaving to see Nam Sin. She thinks his leaving is to see his mum on his birthday. She only makes Nam Sin III help her put on the necklace before she tells him to come back here after seeing his mum. Nam Sin’s mother is aware of the event taking place between Nam Sin and Nam Sin III. She was informed by Seo Ye Na of Nam Sin’s intention to destroy Nam Sin III with the kill switch. Since being informed, Nam Sin’s mother has been working hard on a chip to stop the activation of the kill switch. Going against time, Nam Sin’s mother heads to the location with this chip with an incomplete download of the programming for stopping the kill switch. Nam Sin’s mother arrives with a fraction of a second before Nam Sin’s hand made contact with the button activating the kill switch. There exists a final opportunity for his mother to make Nam Sin change his mind: she’ll do what he wants and asks that he take his anger out on her. However, Nam Sin isn’t happy she hid the existence of a kill switch to Nam Sin III from him. For this, Nam Sin says she lost her chance with getting him back. Nam Sin activates the kill switch and Nam Sin III starts to shut down. Nam Sin III tells his mum to leave. She doesn’t. She has the chip. It’s her birthday present to him that she hopes can stop the kill switch from activating. The chip is inserted into Nam Sin III via the back of his neck. It has effect. The kill switch reverses and Nam Sin III slowly returns. Another danger comes. Seo Jong Gil is present. In the time that Nam Sin III’s systems slowly get back up and running, Seo Jong Gil releases objects aloft Nam Sin III and Nam Sin’s mother. Nam Sin III not fully operational during this time, he’s unable to move. Nam Sin’s mother pushes Nam Sin III out of harm’s way and the falling objects fall onto her. It comes to a moment where Nam Sin’s mother is moments away from dying. She expresses to Nam Sin III she is sorry for breaking her promise of going back to Czechia together with him. She asks Nam Sin III to pass on a message to Nam Sin of saying that she is sorry she’s leaving without him again. Nam Sin’s mother then dies in Nam Sin III’s arms. 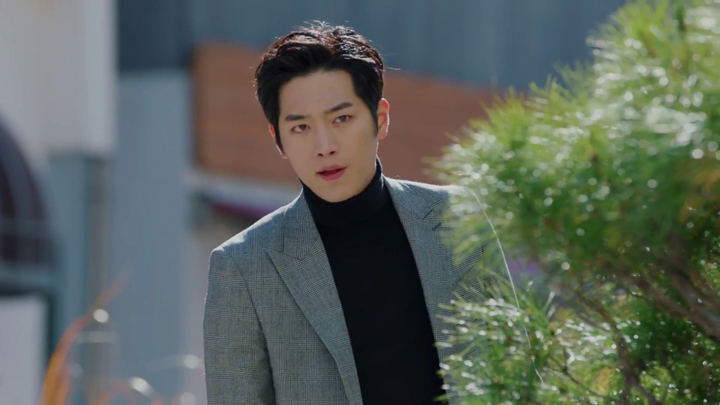 Nam Sin III comes to be on the run, going into hiding after Seo Jong Gil reports to the police that a robot had killed a person. 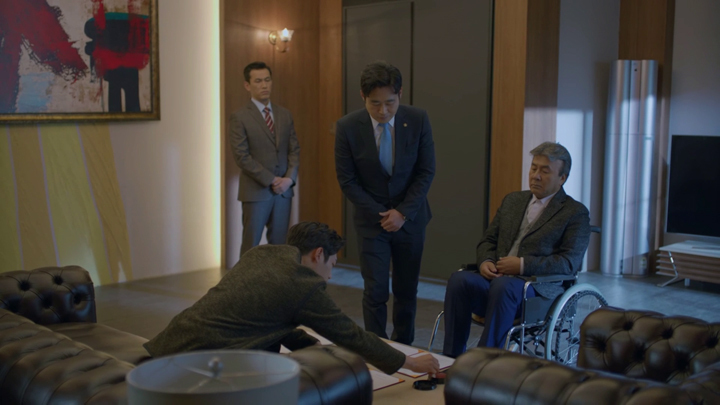 Seo Jong Gil accomplishes his goal of taking control of PK Group when he forces Ji Young Hoon to sign a transferral of stocks contract to him with using Nam Sin’s life as a threat if he didn’t do so. Ji Young Hoon is then arrested by the police as he is seen as the instigator of the actions of Nam Sin III’s actions. Nam Sin becomes the only thing Seo Jong Gil needs to deal with to secure his control of PK Group. He wishes to personally eliminate him and begins to head to the location his men held Nam Sin. Ji Young Hoon is taken as far as just outside the entrance of the police station before he gets released. Seo Ye Na reveals to the police that they’ve arrested the wrong person. With a secret recording providing evidence of Seo Jong Gil to be behind Nam Sin’s father and mother’s deaths, Ji Young Hoon is free to go. Nam Sin III is informed of the situation Nam Sin is in by Ji Young Hoon. Nam Sin III tracks Nam Sin’s location and manages to stop Seo Jong Gil from firing the gun directed at Nam Sin. 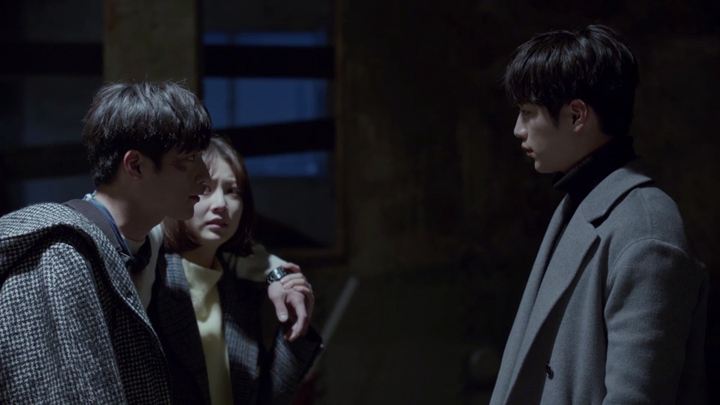 He gets Seo Jong Gil away with a fling of his arm and Kang So Bong helps untie Nam Sin. After Nam Sin III delivers Nam Sin’s mother’s message, Kang So Bong places a wristband watch on him. Nam Sin III says he can pretend to be him if caught. Before Kang So Bong helps Nam Sin get to a safer place, Nam Sin provides a show of him no longer holding hostility towards Nam Sin III: he tells Nam Sin III he is not to blame for his mother’s death. He, himself, is to blame. 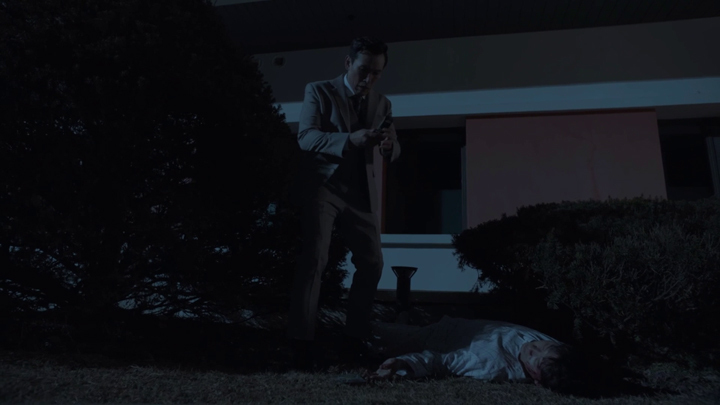 After scaring Seo Jong Gil with the firing of the remaining bullets in the gun Seo Jong Gil attempted to kill Nam Sin with and telling him to not play with people’s lives, Nam Sin III attempts to make his way to Kang So Bong. It’s a race against time, though. The incomplete chip Nam Sin’s mother made and inserted into Nam Sin III’s neck is counting down to the time the kill switch will be activated. Nam Sin III’s watch tells him there is about 23 minutes left. Nam Sin III has that amount of time to reach Kang So Bong and head back with David of whom has looked into the programming and fixed the issue with the kill switch. Nam Sin III’s power continues to decrease as the kill switch gets closer to activating. His movements are unsteady. He has trouble balancing as he walks. 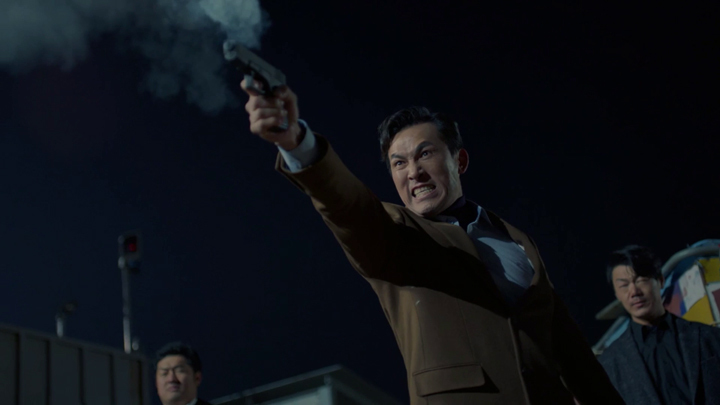 Ultimately, Nam Sin III isn’t able to get to where Kang So Bong is when Secretary Park spots him and he and a group of his subordinates chase after him. There is about two and a half minutes left when Nam Sin III stands trapped with the sea of water in front of him and Secretary Park and his subordinates behind him. Secretary Park wonders if he’s the real Nam Sin. Nam Sin III discreetly discards his wristband into the water behind him and shows his wrist without the wristband to have him believe he is the real Nam Sin. Seo Jong Gil catches up. He rips the gun off from Secretary Park. With Kang So Bong, David and Ji Young Hoon helplessly watching from a location separated by the body of water, Nam Sin III falls and disappears deep into the body of sea water with the firing of multiple bullets that Seo Jong Gil directs at Nam Sin III with. A year later, Seo Jong Gil is in jail. Ji Young Hoon continues being chairman of PK Group. Nam Sin is said to have travelled around for a bit. He comes into Ji Young Hoon’s office and notes how the seat suited Ji Young Hoon. Ji Young Hoon is only filling in. The seat will be returned to Nam Sin whenever he’s ready to take the seat. Nam Sin is fine with Ji Young Hoon being the chairman of PK Group, however. Nam Sin tells Ji Young Hoon he will sell the company if it’s given to him. Nam Sin enquires about how Kang So Bong is doing. Ji Young Hoon has yet to ask. He doesn’t wish to bring things up that will make Kang So Bong feel worse. 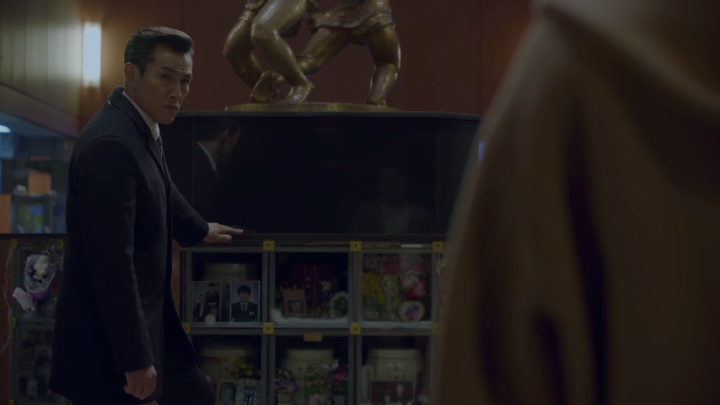 We find Kang So Bong is working at her dad’s martial arts gym now. My Bo—the robot toy Nam Sin III gave to Kang So Bong to keep her company in the hospital after the kidnapping ordeal she went through (Episode 21 & 22)—seems to be around her wherever she goes. Kang So Bong hears old recordings of Nam Sin III in My Bo and answers them. Kang So Bong misses Nam Sin III. Nam Sin’s act makes Kang So Bong stand still. She looks convinced that Nam Sin standing before her is Nam Sin III. Nam Sin breaks out of the act and expresses amazement towards Kang So Bong still having trouble differentiating him from Nam Sin III. Kang So Bong is angered by Nam Sin’s trick that he says was to let her mistaken him for Nam Sin III as a nice gesture towards her. The real Nam Sin III is present. 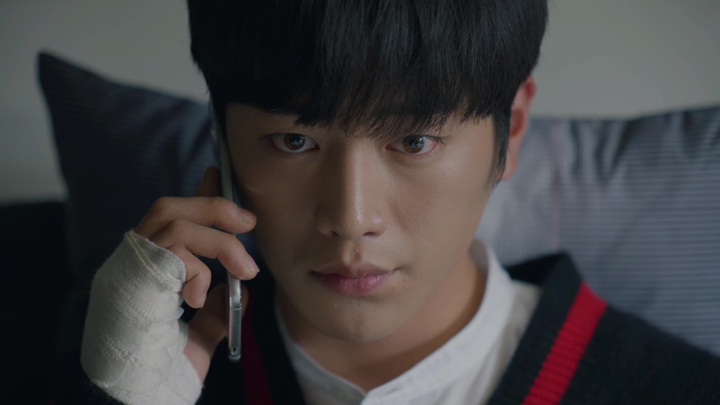 He brings Kang So Bong to find him behind her with asking if she is angry. She then receives a hug from him after he says he must hug them when they cry. 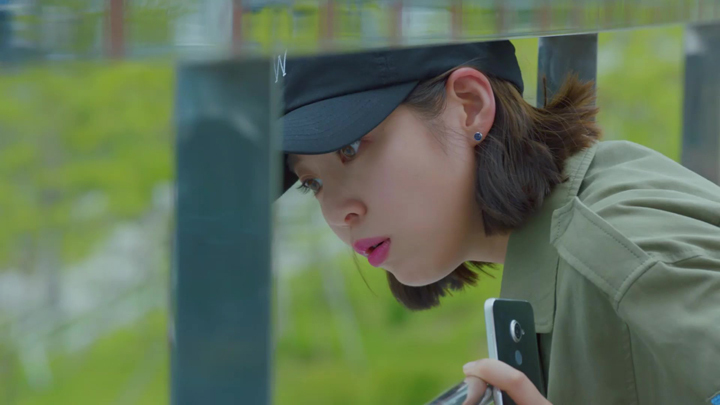 Kang So Bong is a bit more cautious in believing what she sees this time. She asks Nam Sin III if it really is him. Though he isn’t as impressive as before—he’s more average now as he has lost most of the skills he had—Nam Sin III confirms he is himself. Kang So Bong’s reply to this is that she isn’t one bit concerned that Nam Sin III is less impressive than previously. She sees the downgrade as being closer to being like her. The person who had made Nam Sin III’s return possible is Nam Sin. He had used his money and connections to bring Nam Sin III back. 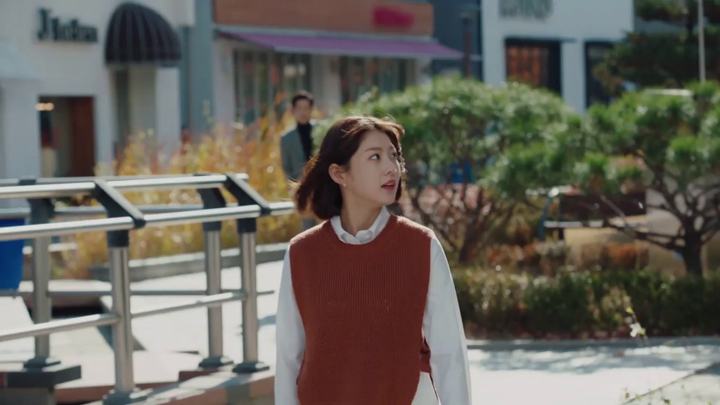 Standing watching the happy scene along with Ji Young Hoon and David, Nam Sin expresses that it’s the first time he found enjoyment in using his money and connections. The end was sweet. It’s so good seeing Nam Sin who was so against Nam Sin III finally accept him to the point of using his money and connections to bring him back. We loved hearing Nam Sin say he enjoyed using his money and connections to bring Nam Sin III back! :oD :oD It’s a huge contrast to seeing Nam Sin always angry at Nam Sin III’s existence and constantly wanting him to disappear. The moment where Nam Sin III delivers his mum’s message to Nam Sin was also a moment we loved because it’s the moment that Nam Sin finally see that his behaviour and actions were wrong towards the situation and Nam Sin III. Had Nam Sin realised the reason his mother created a robot that looked like him was because she missed him and wasn’t created to replace him, things wouldn’t have gone to the point where he’s separated from his mother so tragically. If Nam Sin also believed when Nam Sin III said that he had no desire of the things and people that belonged to him, the situation could have been turned around at a point where things were still repairable and he could have still had his mother around and have the chance to rebuild the great relationship he once had with her. Nam Sin’s mother had said in the scene where Nam Sin wanted to activate the kill switch that she is the only one who can protect them both. She really was the key to protecting them both and resolve the issues between Nam Sin and Nam Sin III. The two finally aren’t opposite forces. That took her dying to achieve peace between the two, though. It makes us wonder, though, if Nam Sin III’s body could’ve been strong enough to withstand the impact of the falling drums in Nam Sin III’s semi-operational state and shield his mother from the impact. He couldn’t move, but we’re thinking the metal he’s made out of could’ve made the drums bounce away… But then again, we remember Nam Sin III’s strength came about from an input of muscle intensity… This might require systems to be fully operational. So, maybe not. But whether Nam Sin III’s body could shield his mother from the danger above them or not, we do accept what came to be the outcome. The fact that Nam Sin’s mother saw Nam Sin III as her son, naturally she would react in the way that a mother would to protect her son from harm regardless of whether he’s capable of saving himself or not. 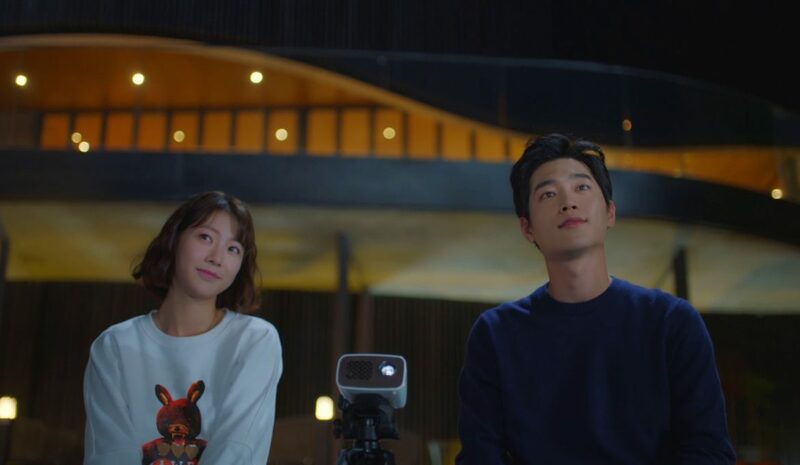 We had said at the start of this post that we didn’t expect a happy ending for Are You Human Too? and did prepare ourselves to find an unhappy ending. 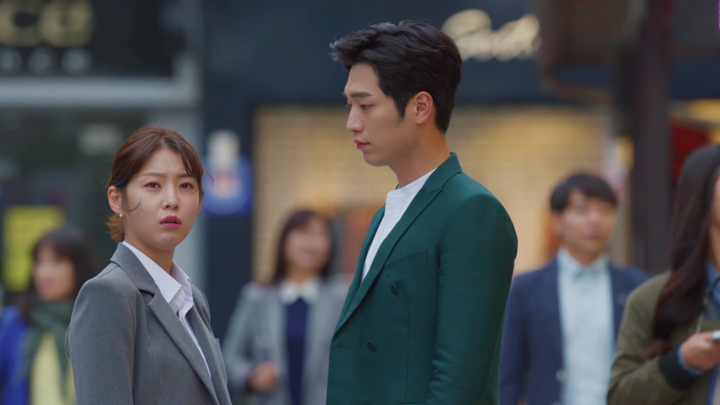 It had a human-robot pairing that we thought might have something that would prevent a happy ending for the pairing in this drama. 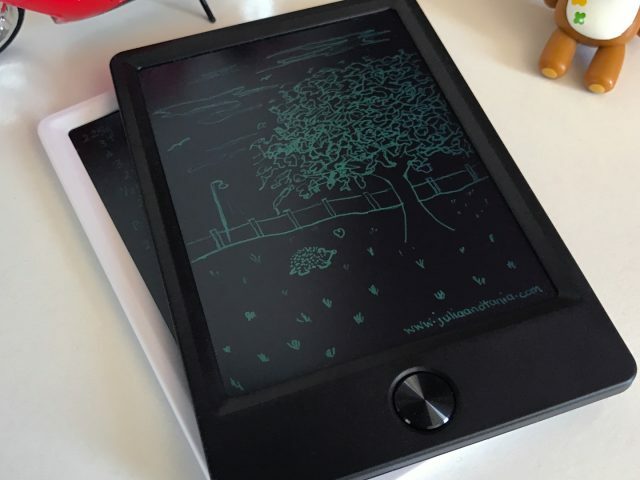 Our expectation of possibly finding an unhappy ending in Are You Human Too? came from having watched a previous drama with a human-robot pairing and that had ended up with an unhappy ending. The drama was Absolute Boyfriend – 絕對達令 (also known as Absolute Darling which starred Jiro Wang and Ku Hye Sun), a 2012 Taiwanese live-action adaptation of the Japanese manga, Absolute Boyfriend by Yuu Watase. Just like in Are You Human Too? 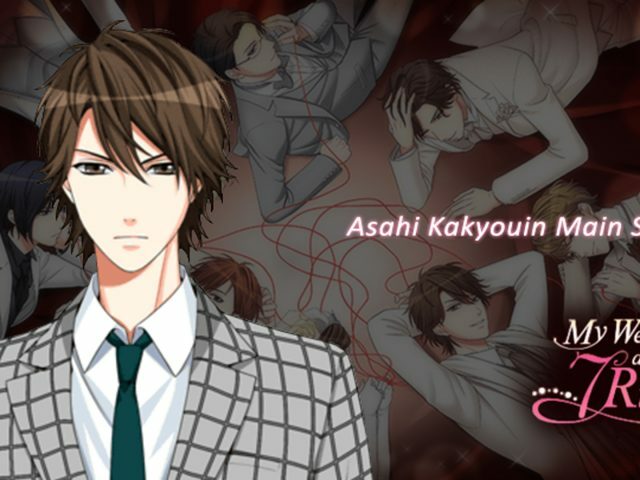 the robot in Absolute Boyfriend was accepted by the female lead. She was willing to spend her life with him as his wife. However, the robot ultimately was put into storage and there was no chance the female lead character could be with the robot in her lifetime because the technology required to sustain the robot advanced at a rate far beyond the capabilities of the technology that was available at the present time. The ending was an unhappy ending. It was very sad unhappy ending! With Are You Human Too? there wasn’t this concern of technology not advanced enough to support the rate of growth of the AI robot. But, we worried that robots would be brought up as being a threat to humans and this could be the thing that ends in an unhappy ending. Such thing is always brought up in a drama that focuses on robots existing in a world of humans. We found Are You Human Too? somewhat touched on this, too. But the drama ended happy. Robots are non-threatening. They can be heroic and can coexist with humans who make up for what humans lack! However, there was something interesting that Nam Sin III said in the episode where Nam Sin III reveals himself to the world. It made us wonder if an originally good-natured robot that is as advanced as Nam Sin III could become a threat to humans. Nam Sin III said to Kang So Bong that he is glad that he is Kang So Bong’s robot. The reason Nam Sin III said he was glad he was Kang So Bong’s robot was because he said he would have ignored his rules and hurt people had he been in the hands of Seo Jong Gil or Nam Sin—both of which harboured bad intentions. This brought us to go against the thought with thinking that an AI robot shouldn’t hurt people so long as there were rules like Nam Sin III’s Number #1 rule of hugging people whenever they cried. These kinds of rules would always return an originally good AI robot who’s gone bad back to being a good AI robot just like how we saw with Nam Sin III who went back to following the rules of never harming people after seeing Kang So Bong cry. But thinking it over again, the ability for an AI robot to act like someone so well that people can’t differentiate the real from the fake as well as the ability to easily access systems, we thought this could bring problems that may not be so dramatic as physically harming people but could still harm people in ways like identity theft just like how Nam Sin III could fool people into believing he was the real Nam Sin. We also saw how easy it was for Nam Sin III to access and control systems like the self-driving car or get into traffic control systems to change the pedestrian lights. We can see why Nam Sin III said he can hurt people if he was in the hands of someone like Seo Jong Gil and Nam Sin even for an AI robot like Nam Sin III who was programmed to be a good AI robot who doesn’t harm people. This was something Nam Sin III had said that we found quite interesting. But, no need to worry. Nam Sin III is Kang So Bong’s robot. 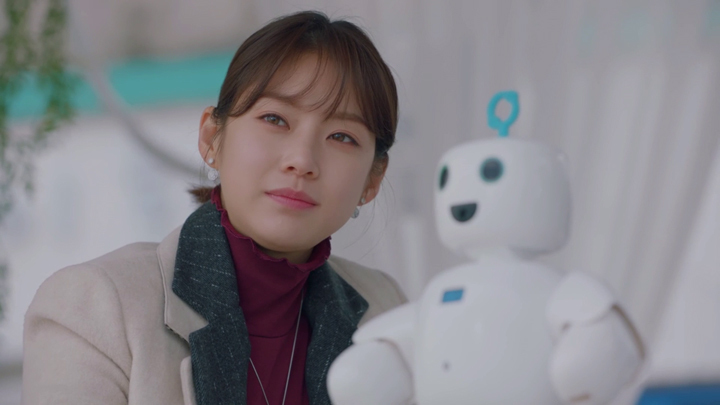 She will guide this cute AI robot well and he will be guided well when Kang So Bong doesn’t see Nam Sin III as a powerful machine that she can use for her gain—actually, Nam Sin III isn’t a powerful machine anymore. In that last sequence of scenes of the last episode, Nam Sin III did say he lost a lot of his abilities and is more like an average human now. This means he most likely isn’t able to be like a superhuman being who can go into burning buildings and stop massive structures to save people or do things like jump over and land perfectly on the rooftop of a moving car, right? We wonder if he can still do things like access systems. We’re thinking he might not even be able to do that now. He did say ‘average human’. We do love how the drama ended with a happy ending for Kang So Bong and Nam Sin III. But, we feel there is room for an alternate ending in something like a fanfic. We feel that there’d be an interesting story developing Nam Sin and Kang So Bong. Nam Sin is different in personality to Nam Sin III, but he’s become good and has gotten rid of that irrational and emotional side of him making him calmer now and that much closer to Nam Sin III’s temperament which we like. With Nam Sin pretty much indebted to Kang So Bong because his behaviour brought Nam Sin III to disappear and a likable personality now, this would make for an interesting start of a story in something like a fanfic if the story did end just before the final sequence where Nam Sin III returns. Moment: How can one feel disgusted with those looks! Reporter Jo is the only person who didn’t feel disgusted by Nam Sin III when she first sees him in person. Stereotypically, Reporter Jo is curious about how real Nam Sin III is. She is given permission from Nam Sin III to feel him. 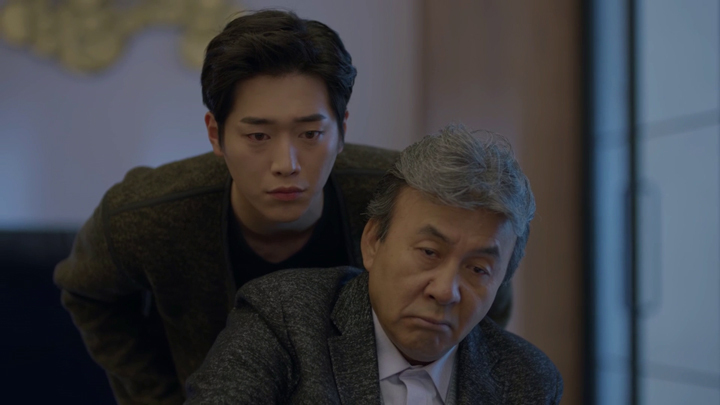 Kang So Bong’s father walks in and sees Reporter Jo feeling Nam Sin III. He is appalled by Reporter Jo groping Kang So Bong’s man. Hehe. Moment: Nam Sin III tries to act like a human man. The guys at Kang So Bong’s martial arts gym uses Nam Sin III to help attract female signups. The females go wild after the guys tell Nam Sin III to launch his smile. Yup! That smile is super powerful! Moment: He’s not my son. He’s my future son-in-law. 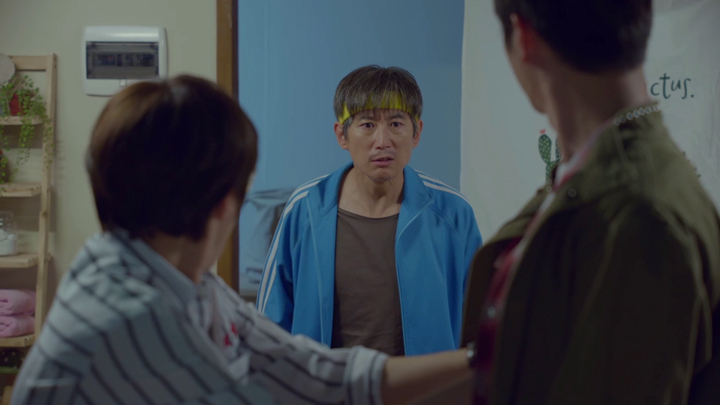 Kang So Bong’s dad accompanies Nam Sin III to buy a gift for Kang So Bong. This is a necklace that is an exact mirror of the one that belonged to Kang So Bong’s mother of which Kang So Bong gave to Nam Sin III. The salesperson had seen Nam Sin III to be his son. 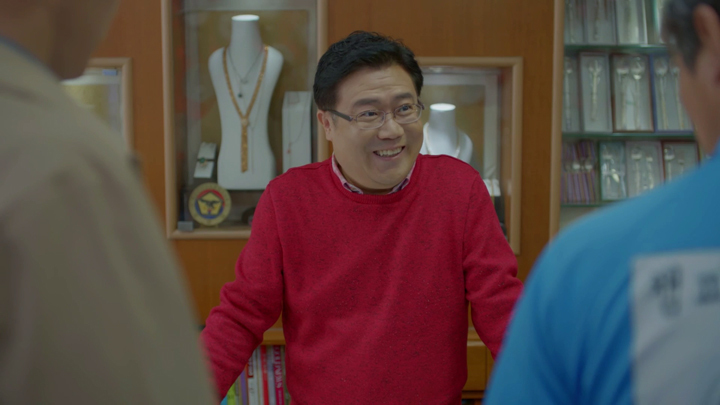 Kang So Bong’s dad profusely tells the salesperson he’s got it wrong with thinking the young guy with him is his son. No way is Nam Sin III his son. But, son-in-law? Yes! Kang So Bong’s dad tells the salesperson the young guy with him will be his son-in-law. What a cool dad! Nam Sin III says ‘I love you’ to Kang So Bong after a kiss to say his last goodbye before meeting up with Nam Sin who will activate the kill switch to end his existence. This was a super cute scene between Kang So Bong and Nam Sin III!